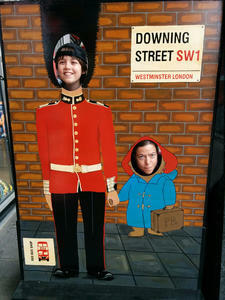 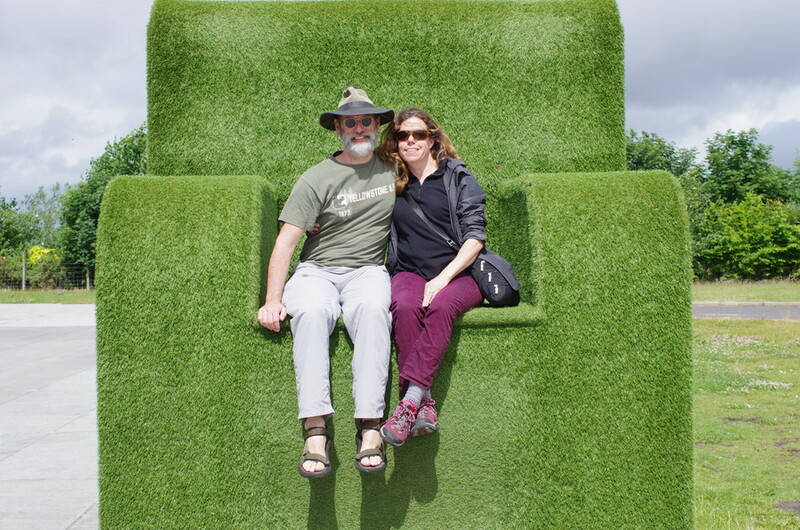 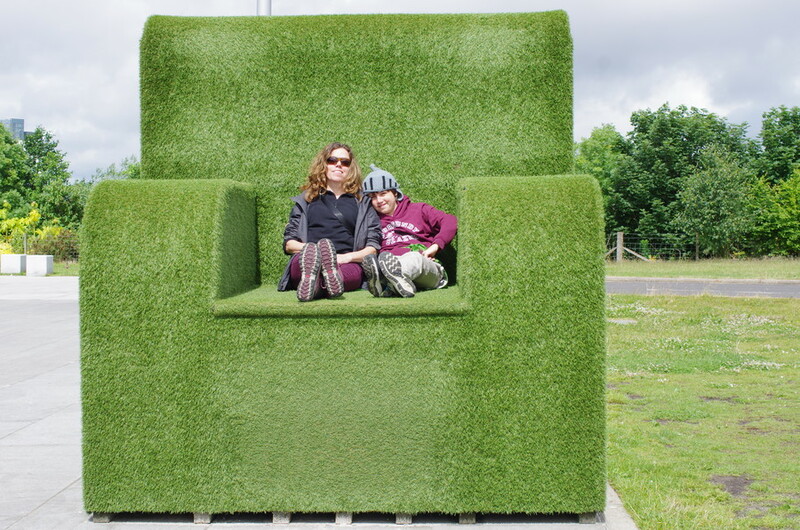 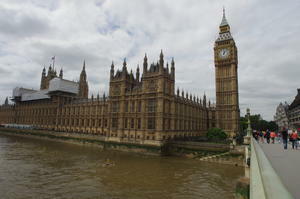 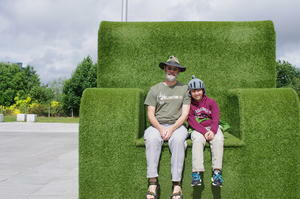 We took a nice vacation to Great Britain this month. 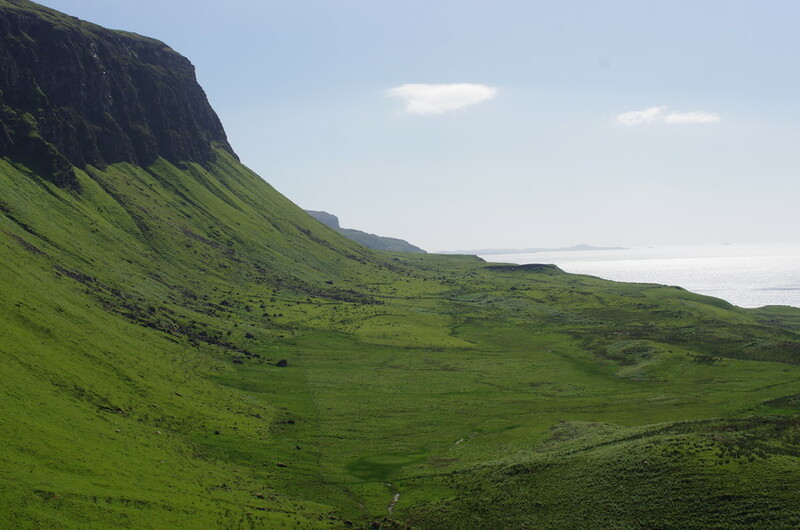 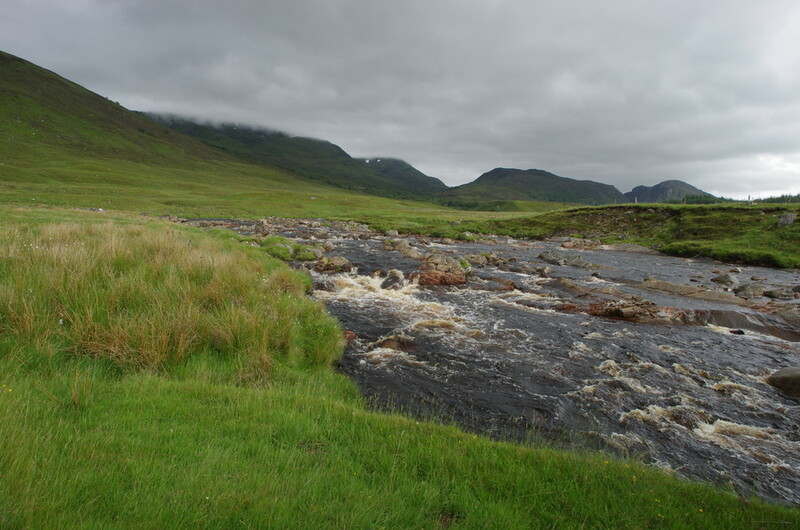 For David, a return—of sorts— to a trip he took with his folks to Scotland in 1976. 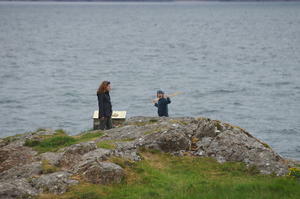 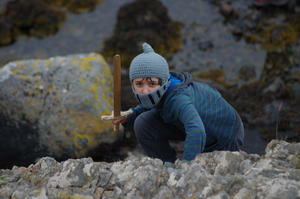 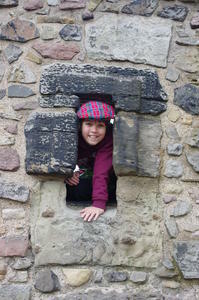 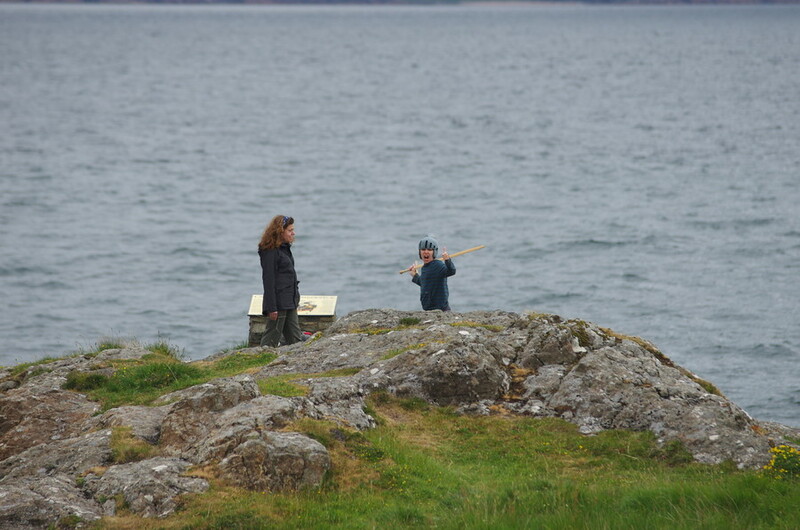 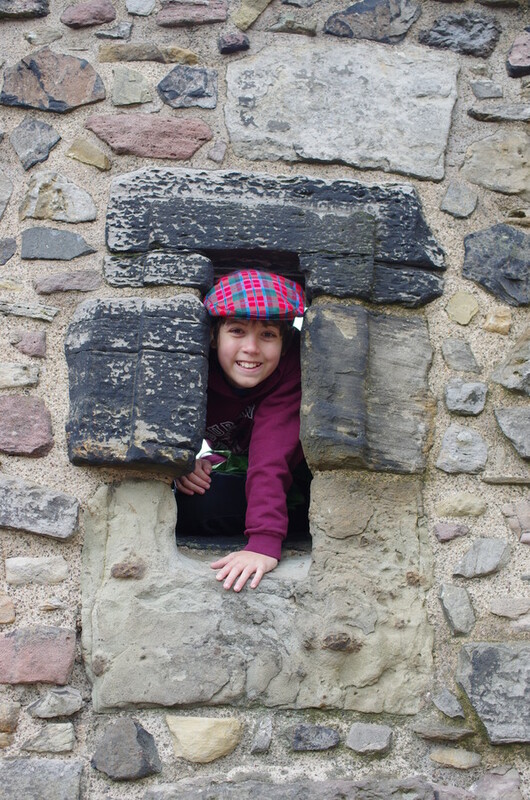 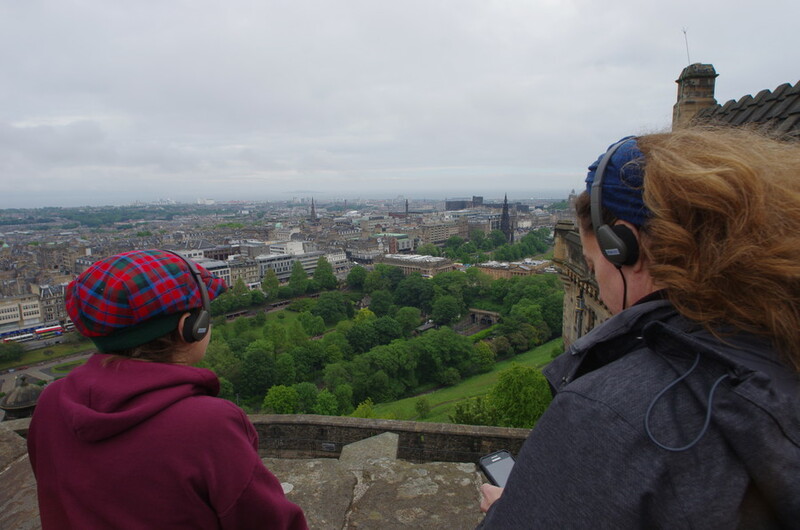 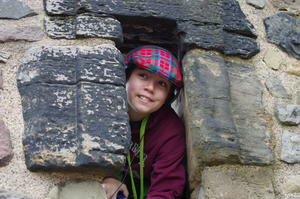 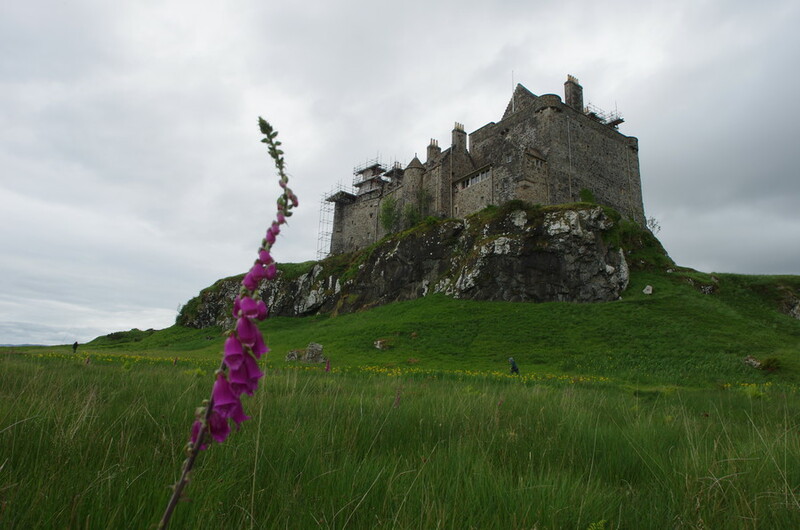 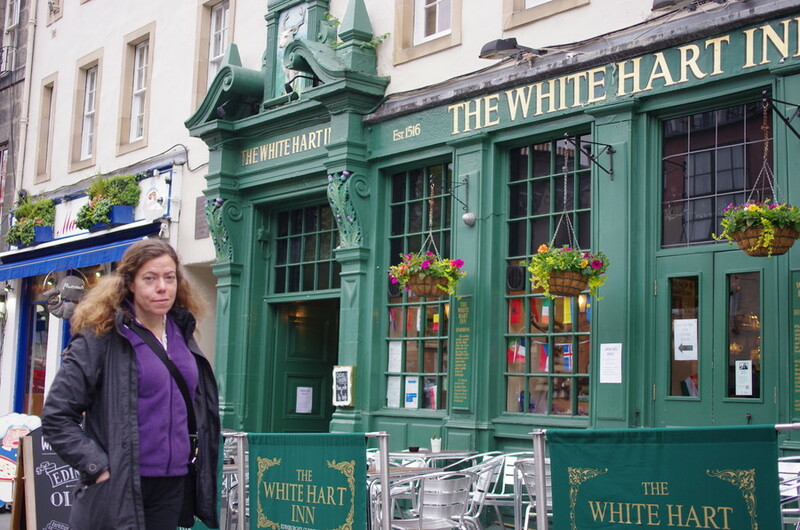 Sarah has spent much more time in GB, but this was her first trip to Scotland. 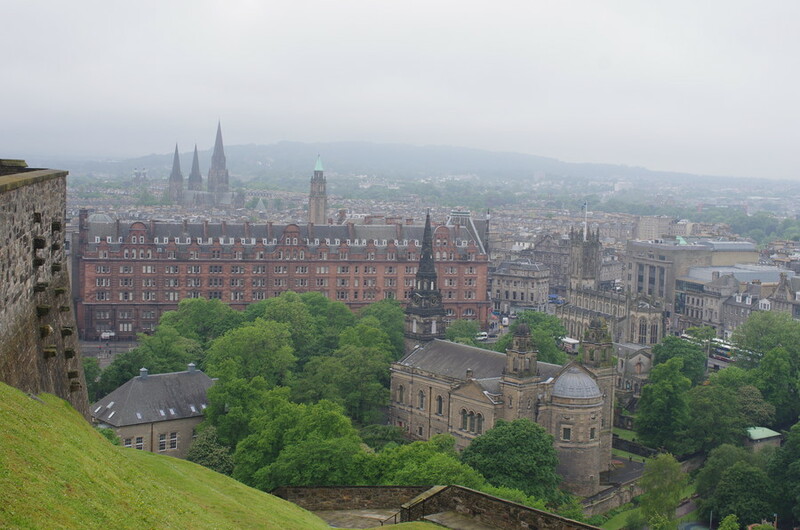 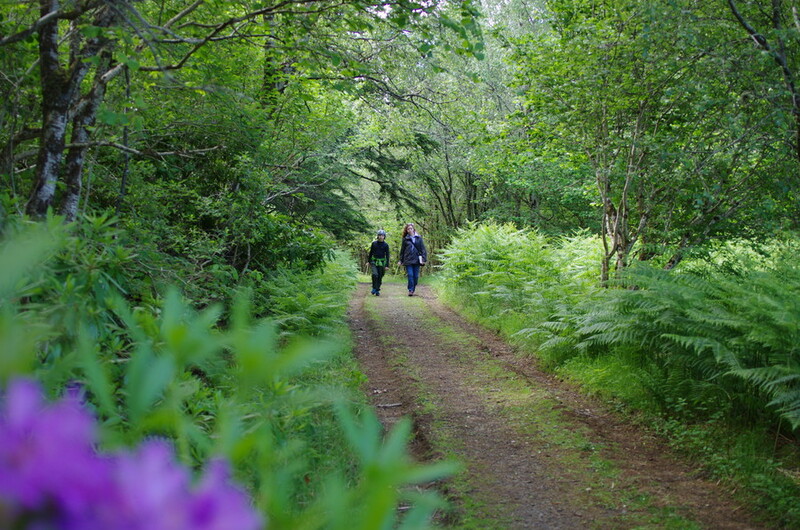 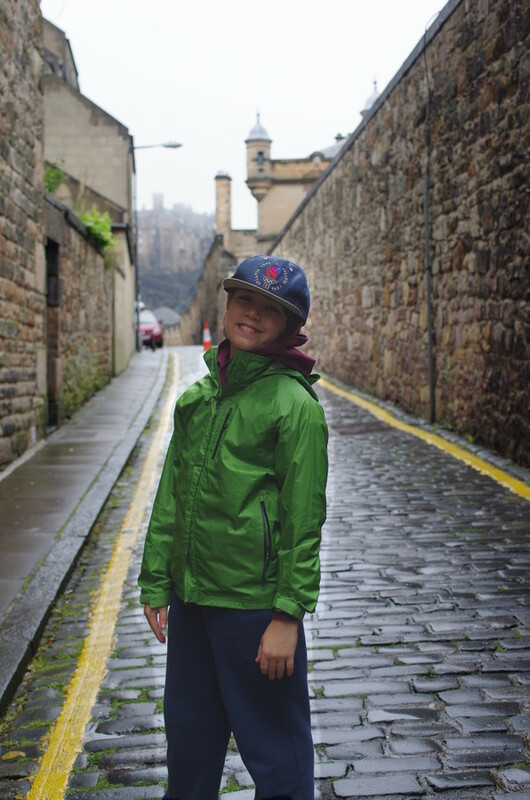 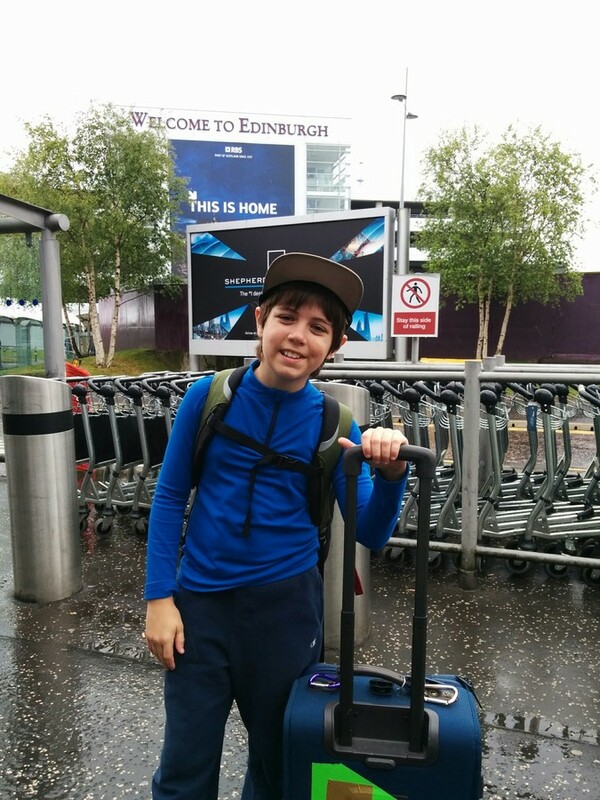 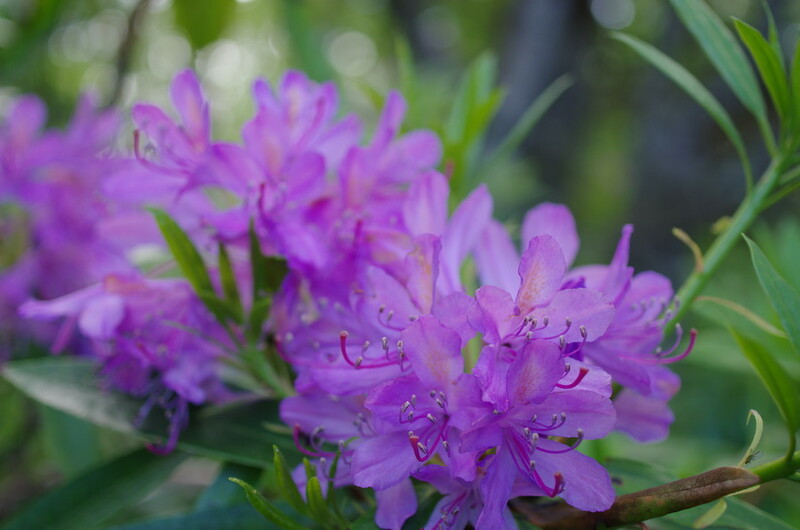 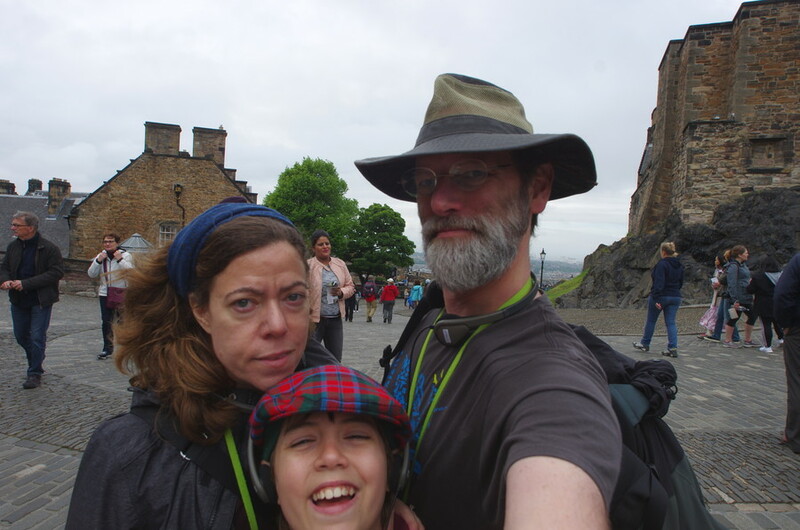 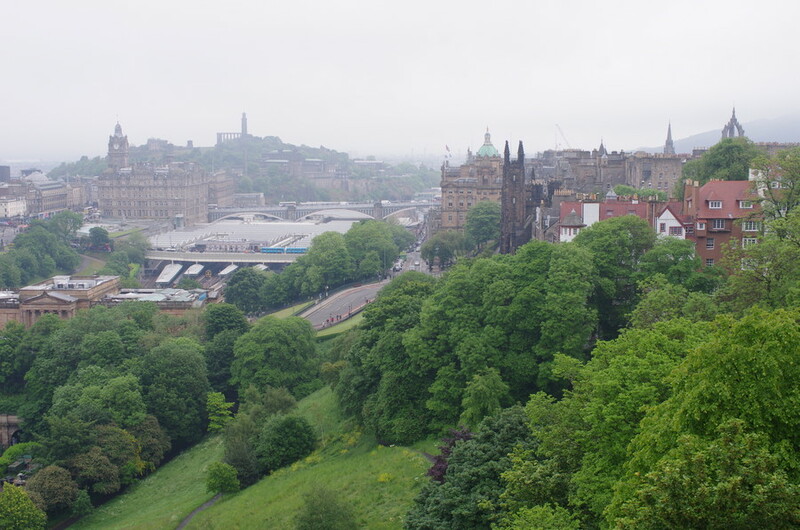 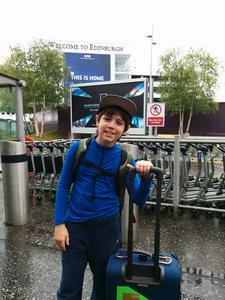 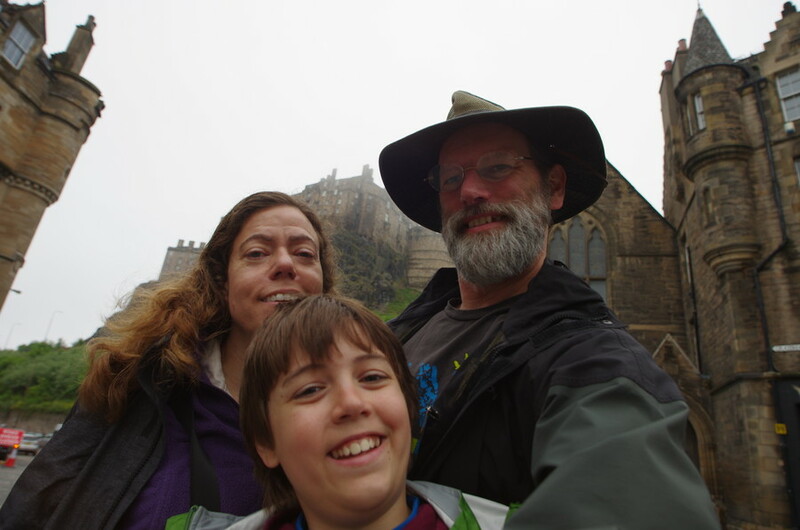 We took an overnight flight (via NY) to Edinburgh; dropped our luggage at the Premier Inn and went for ramble around the neighborhood. 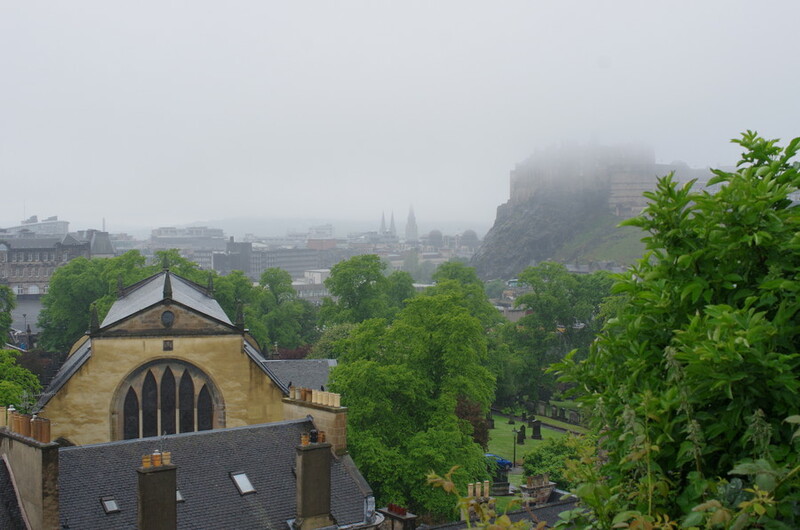 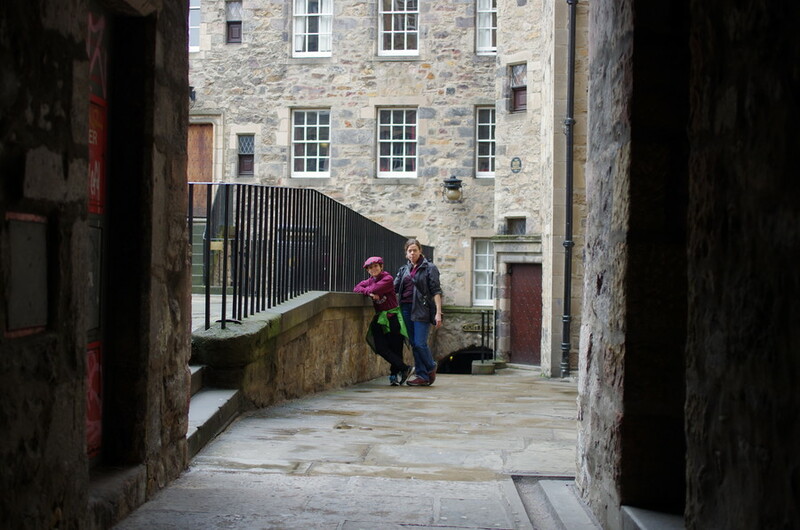 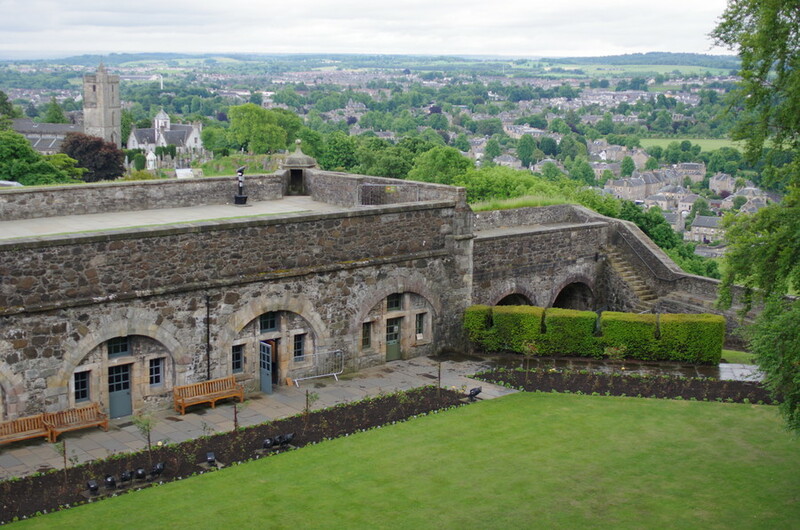 What a cool neighborhood: we spent some time in the National Museums of Scotland which had this cool Claymore (Great Sword) in the basement and view of the castle in the mist from the rooftop terrace. 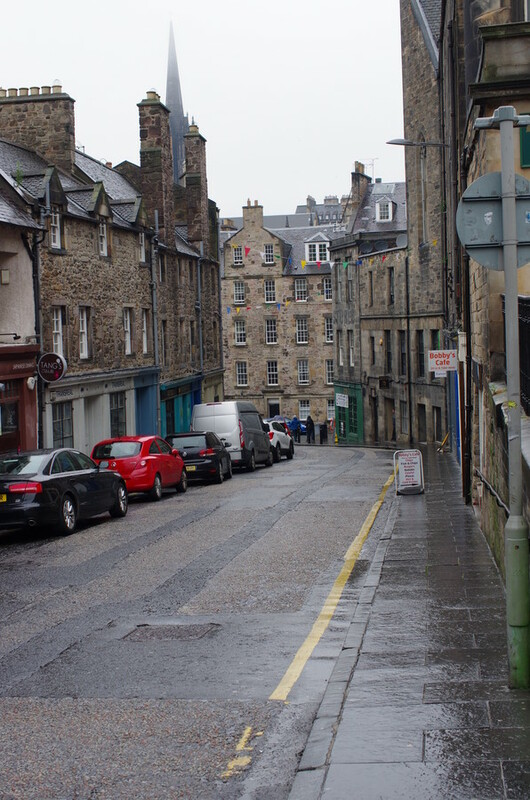 The streets in old Edinburgh clearly predate cars and multi-lane roads. 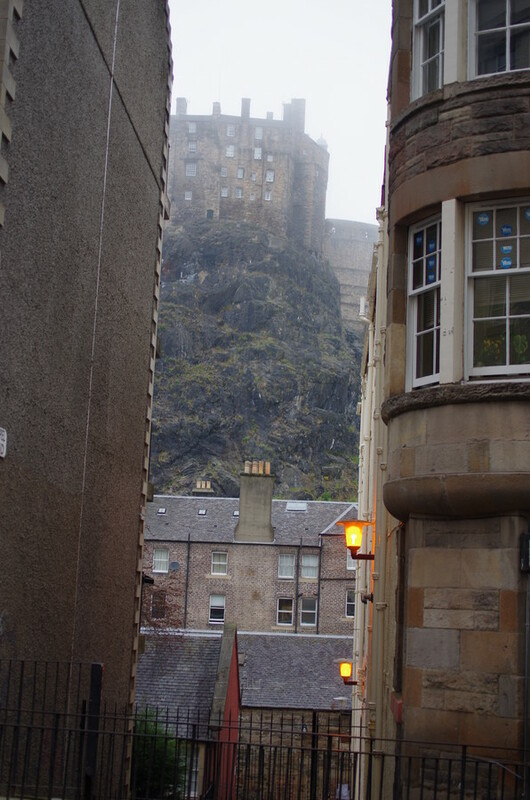 Having just gotten off the plane, those narrow, old streets really helped to make the point that we weren't in Kansas (or Alexandria) anymore. 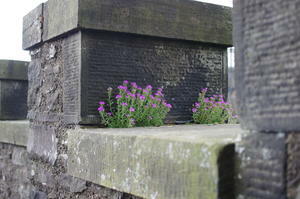 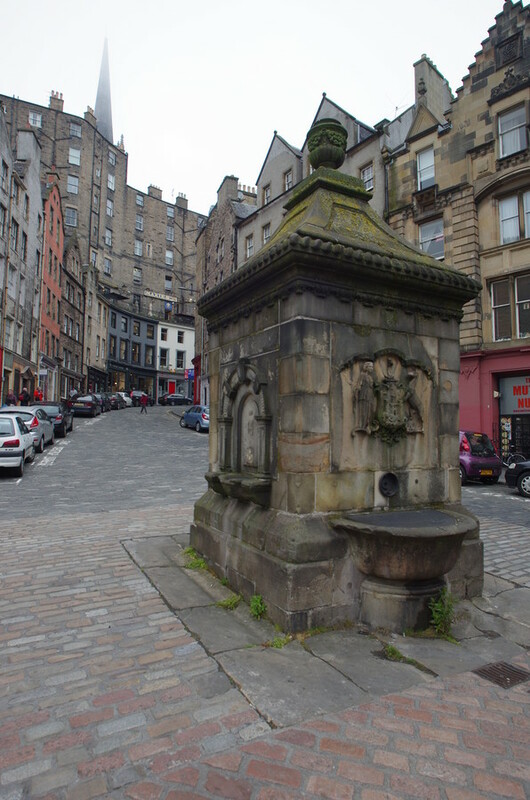 The Grassmarket, site of commerce from 1477 on, was also the site of public gallows starting around 1660. 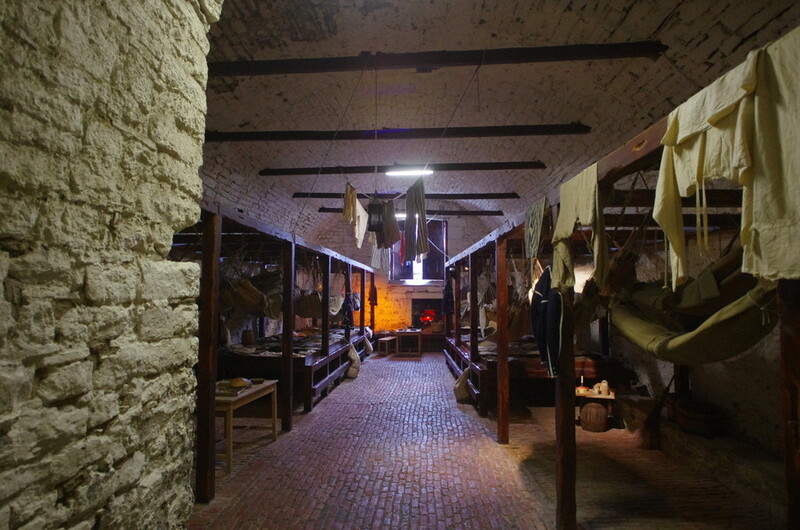 On the history scale, it puts Alexandria in it's place as a relative newcomer. 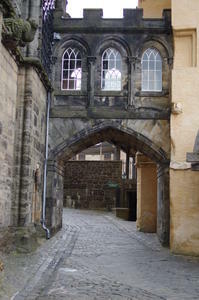 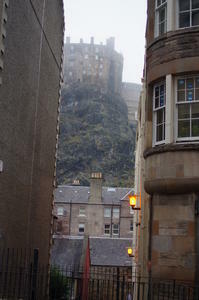 It was great fun to walk around those streets and glance up to catch sight of the castle overlooking the area. After an early evening and good night's rest, we headed up the hill to the castle. 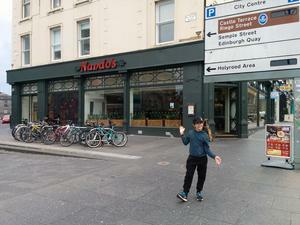 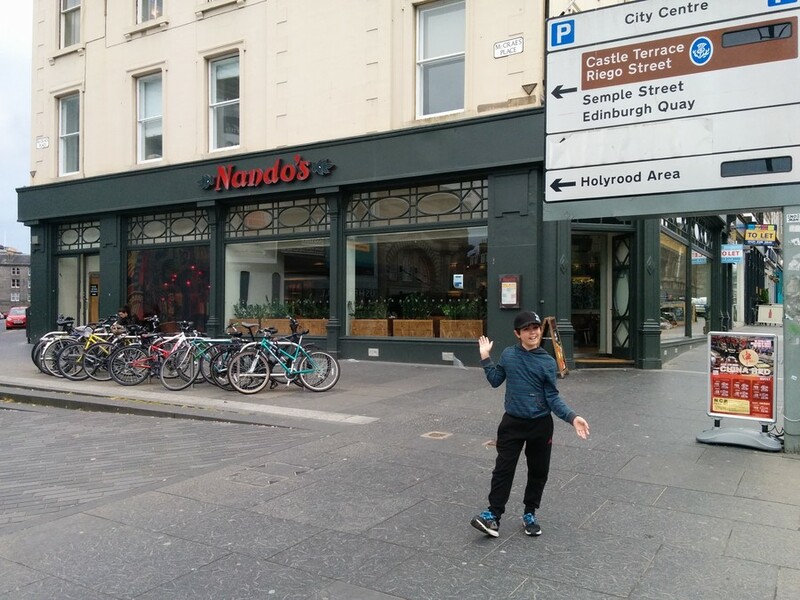 On our travels in Edinburgh, Robert spotted this Nando's; the one in Alexandria has become a favorite haunt of his 6th, now 7th grade class. 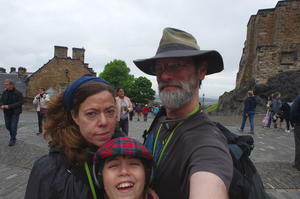 We took a commemorative photo, but managed to avoid any restaurants available to us at home during out stay. 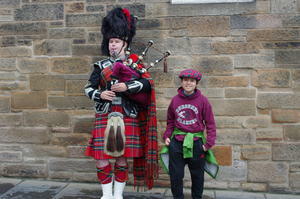 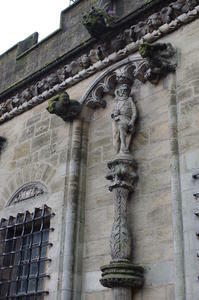 Walking up to the castle, we ran across the little alleyway / courtyard above (to the left) and this piper on the street. The line for castle tickets was not too long (thanks to Sarah, Robert and David were able to enjoy the view while she dealt with the queue). 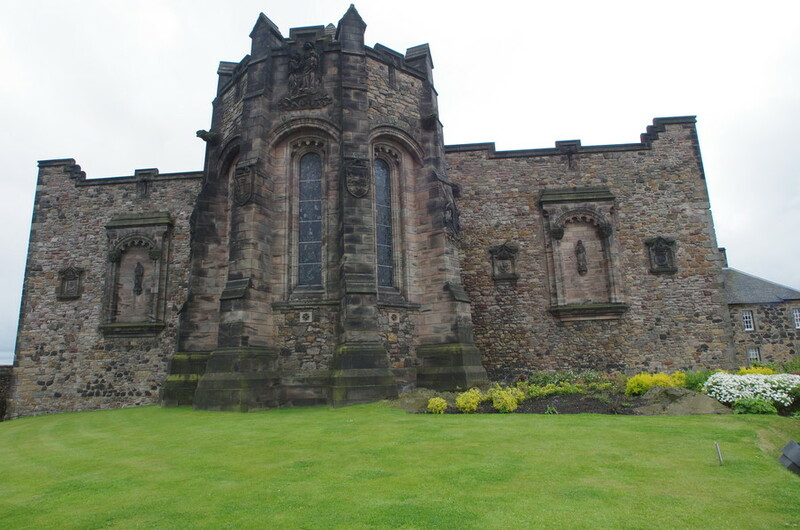 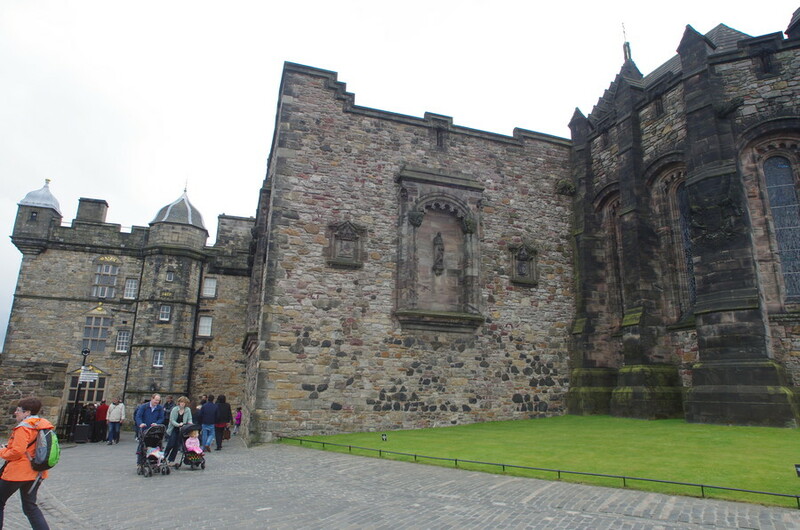 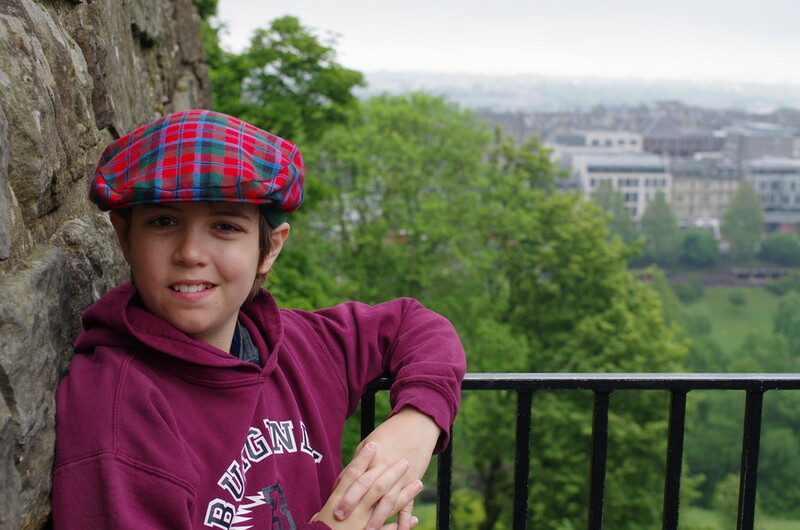 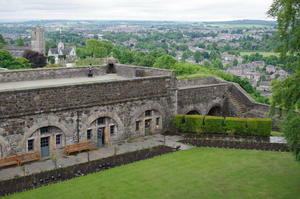 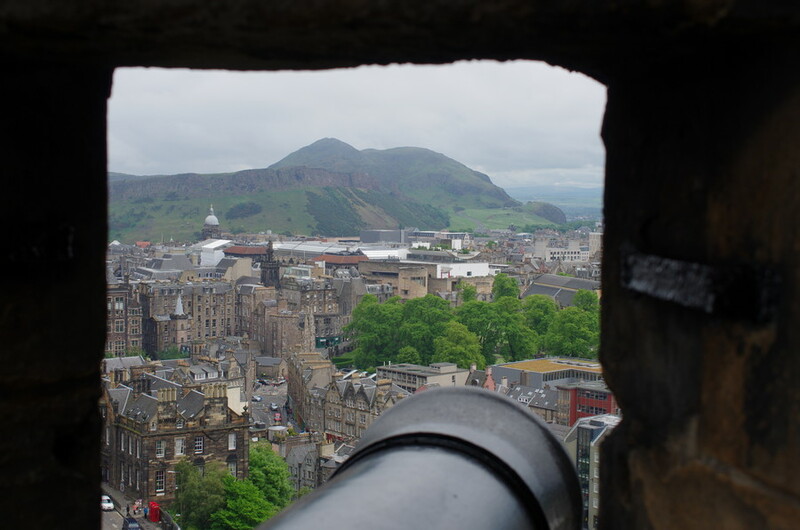 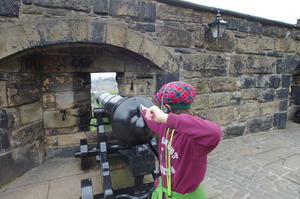 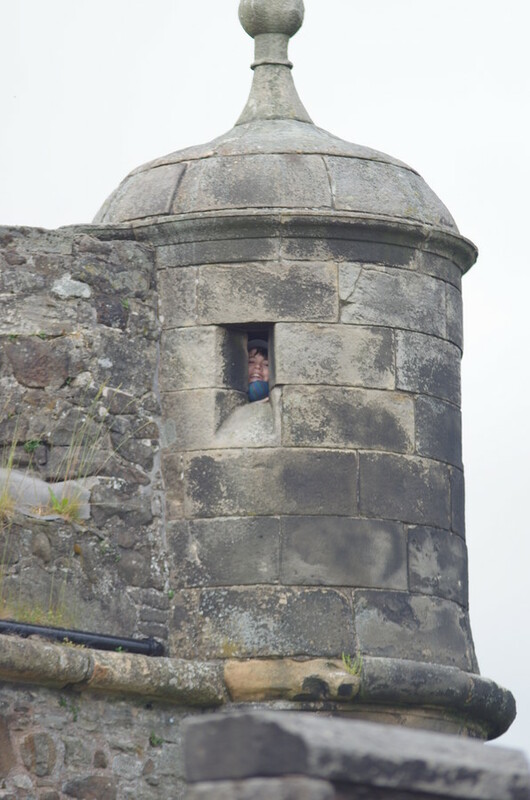 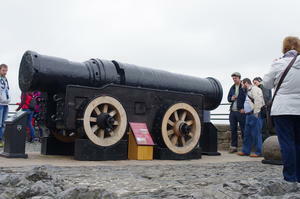 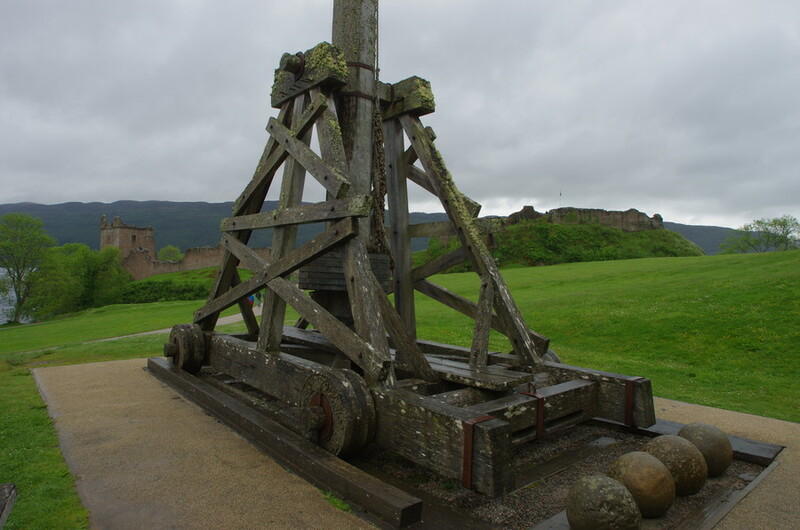 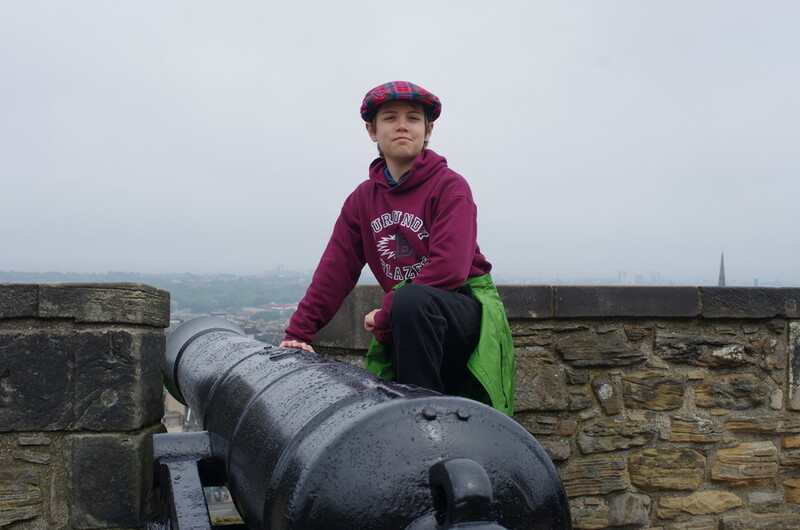 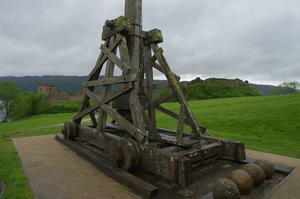 Of course an early stop past the walls was a cannon; Edinburgh Castle comes with many. 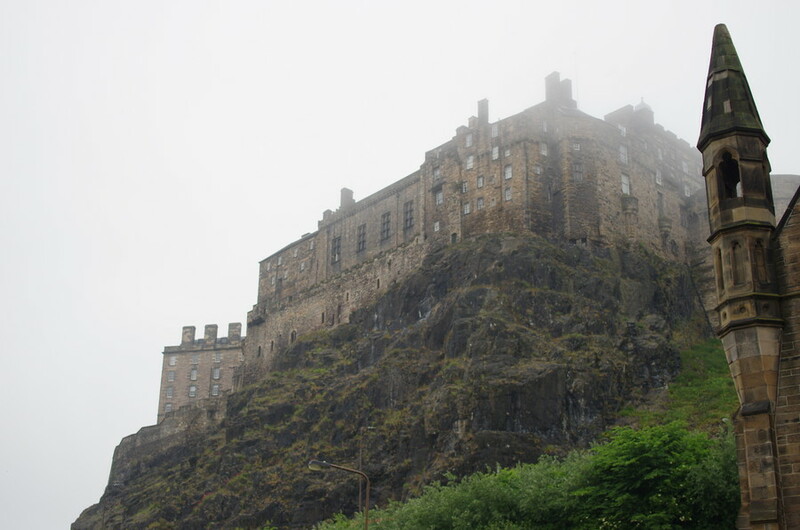 They were setting up the stands for the annual Military Tattoo when we were there; looking at the numbers of seats, we were OK missing that even though it looks like grand fun. 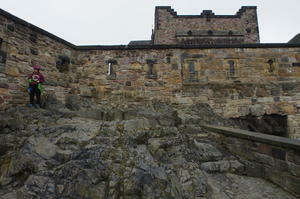 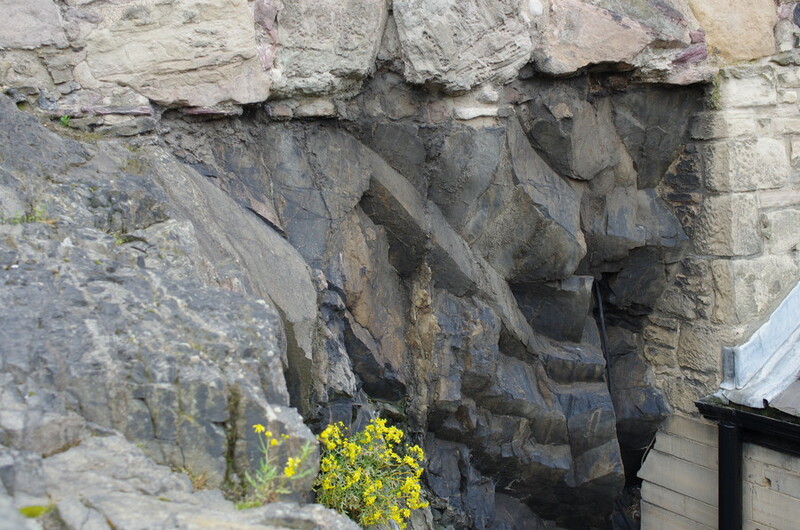 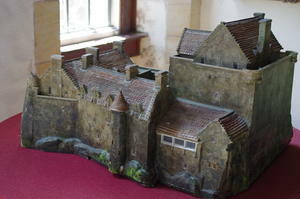 The way the castle is built on top, into and out of the rocky mount there is impressive. 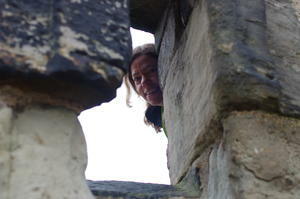 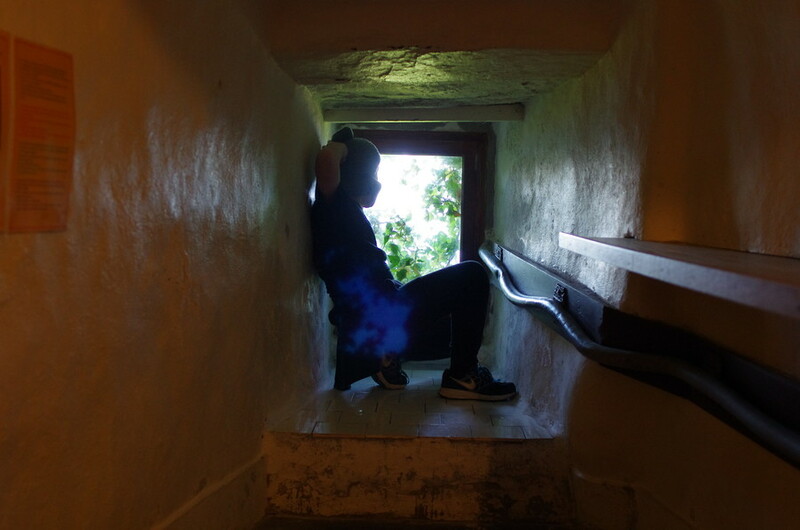 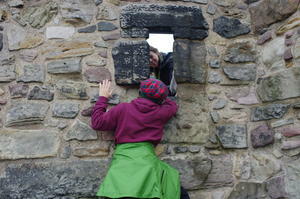 And the arrow slit windows are fun to play with. 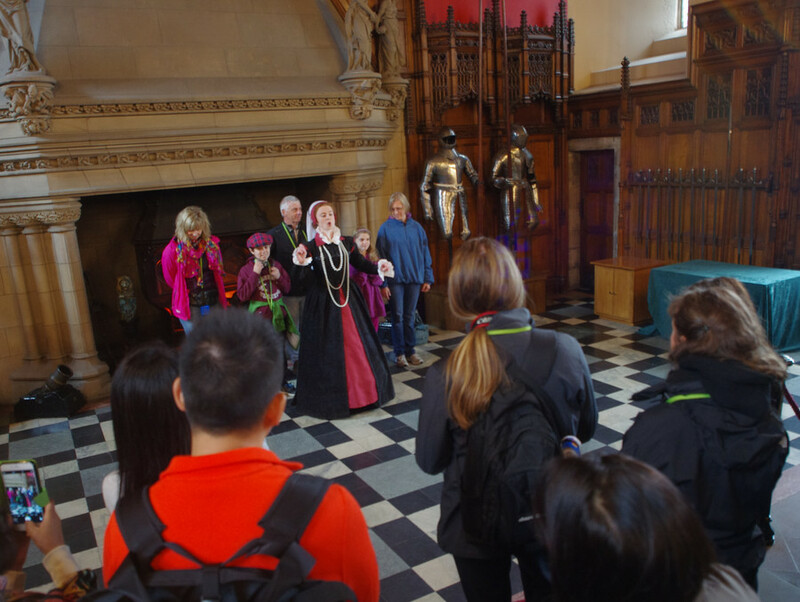 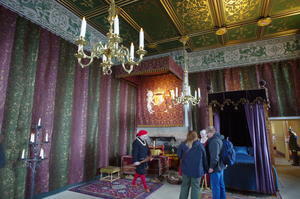 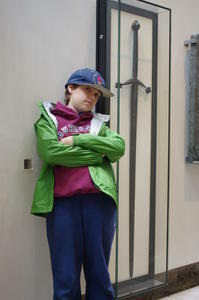 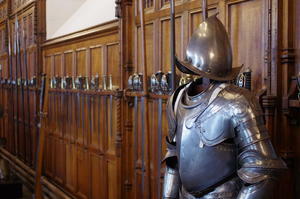 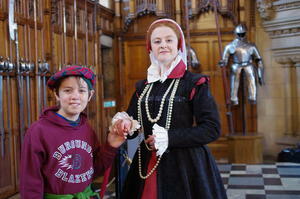 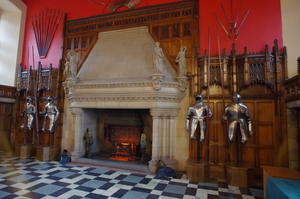 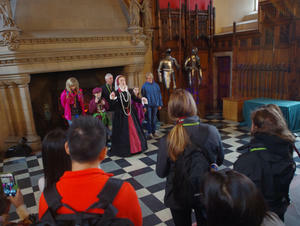 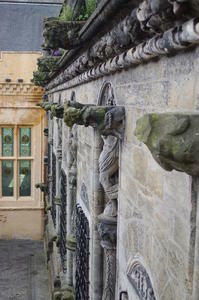 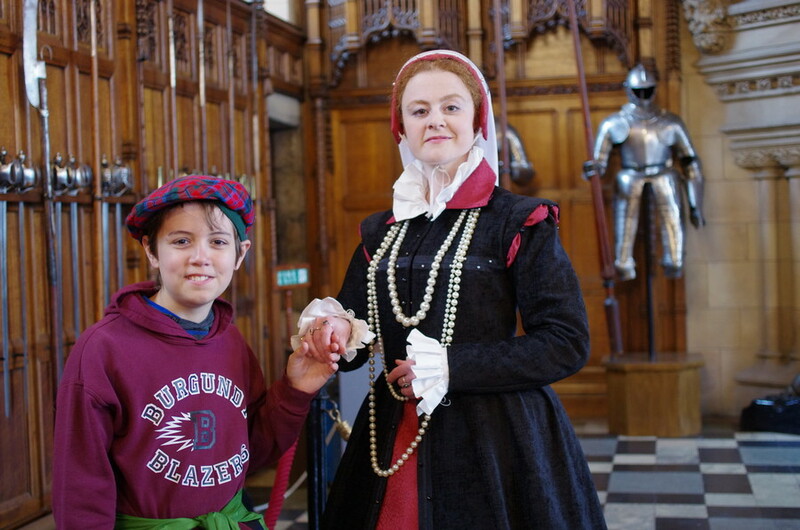 When we entered the great hall, an Elizabethan interpreter was showing the visitor what may have happened in that hall. 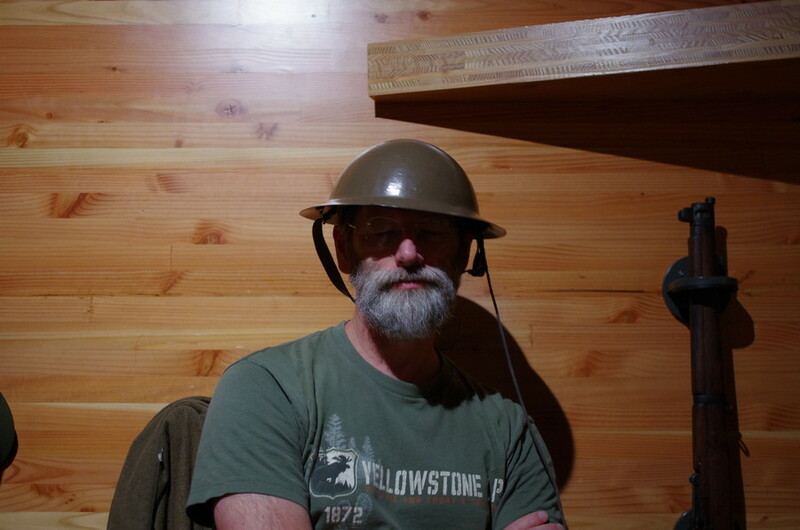 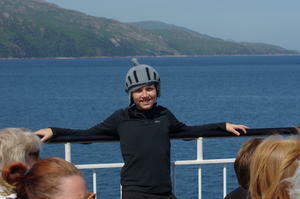 We think Robert was an attractive audience volunteer because of his choice of hat for the day. 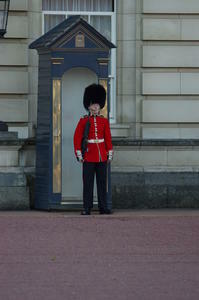 He was invited up to join in the demonstration by the "queen." The tickets Sarah picked up for us included the audio tour. That was a winner: well produced, fascinating details and easy to key in a number at various spots for information about what you were looking at. 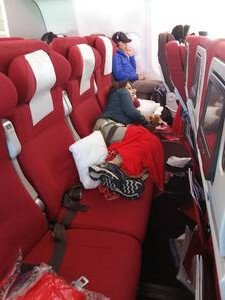 After that initial experience, we were hooked for the rest of the trip. We finished off our first castle visit with a tour of the prisons — dungeon is such a harsh word. 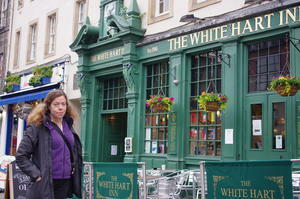 Not someplace you'd like to spend any time. 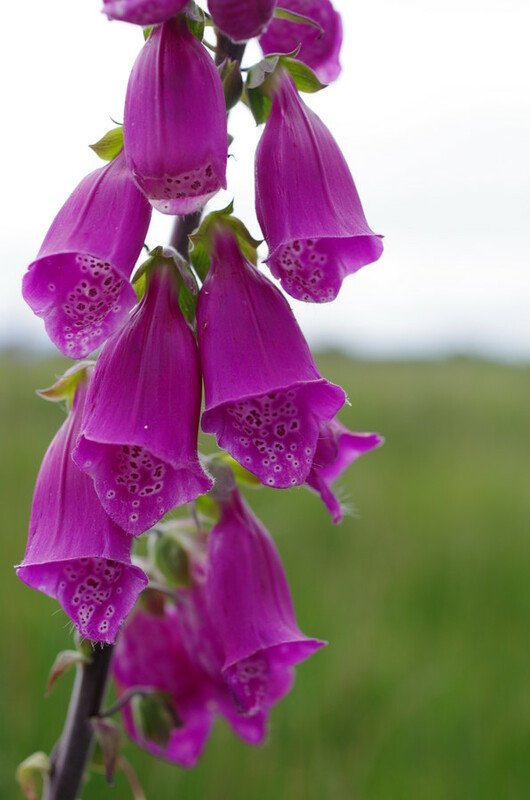 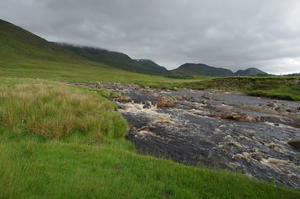 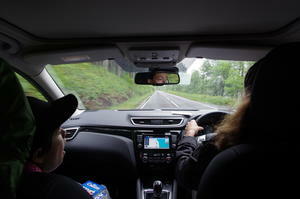 The next day, we picked up a car and started making our way around Scotland. On the way to the local car rental office, we were passed by this parade of taxis. 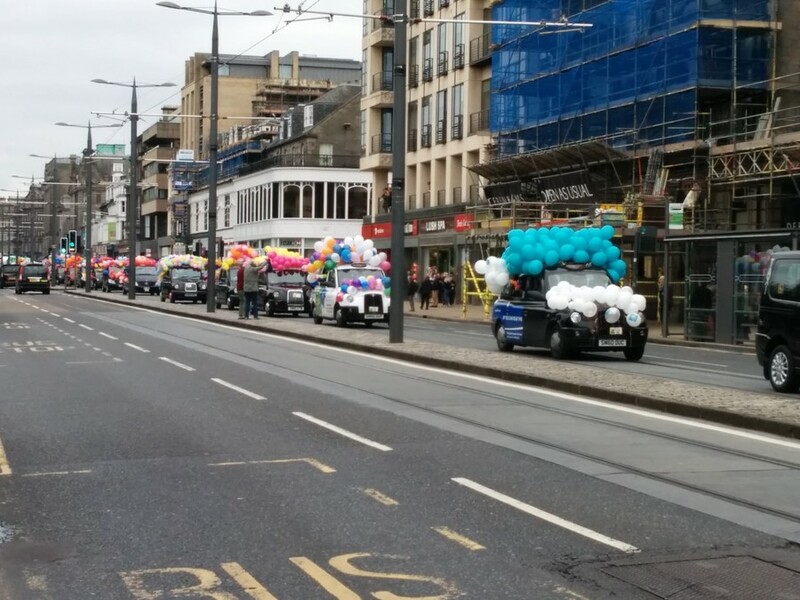 Every year, the taxi drivers take the disabled kids of Edinburgh to the beach for the day. 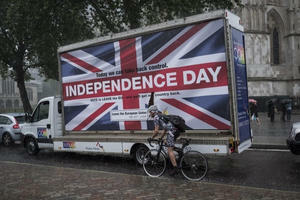 The weather was not the best (but they have certainly had worse summer days): cool and misty off an on. 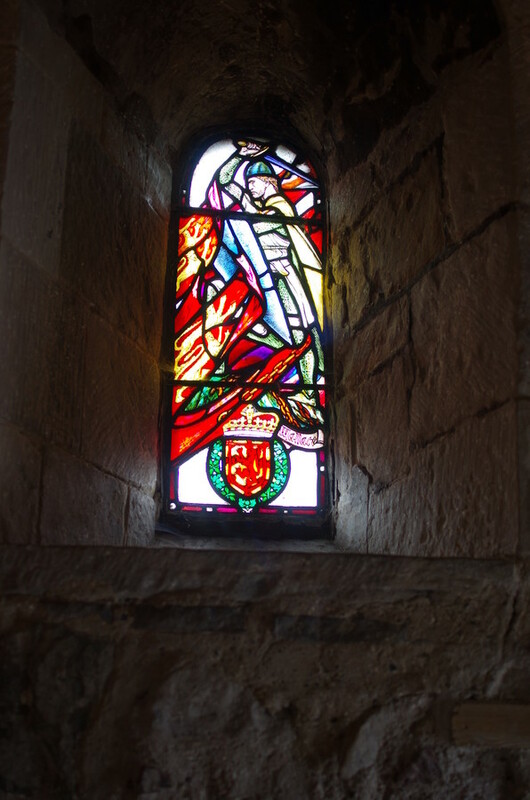 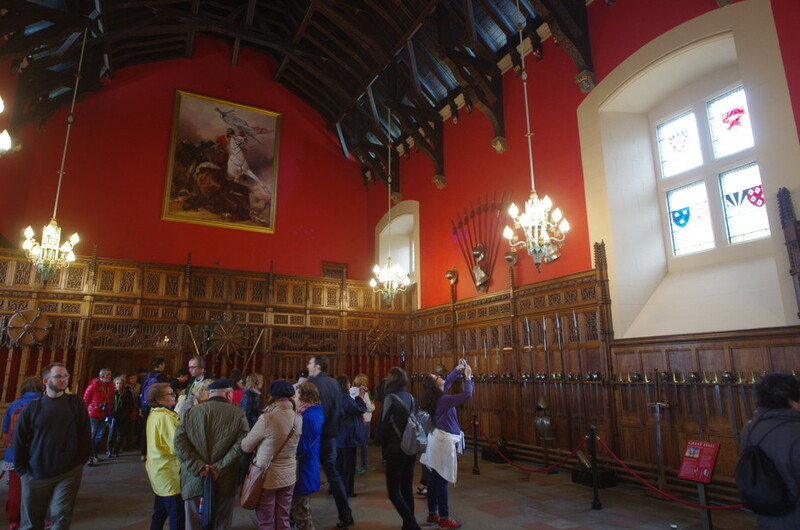 Our first stop on the driving tour: Stirling Castle, site of Robert the Bruce's defeat of the English in 1314 in the Battle of Bannockburn. 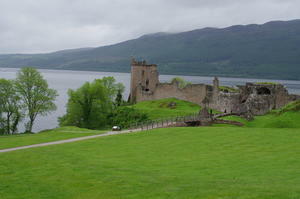 The views from the castle were again breathtaking; it's clear that castles on high ground are a thing. 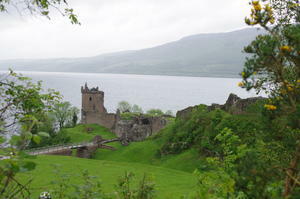 As is history in that part of the world. 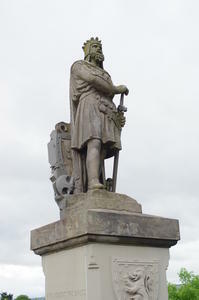 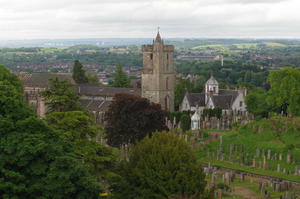 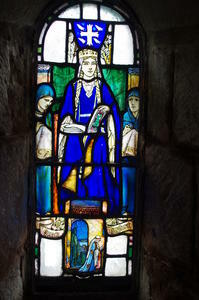 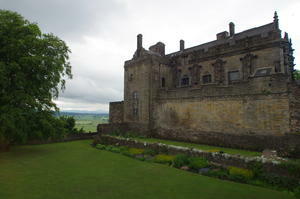 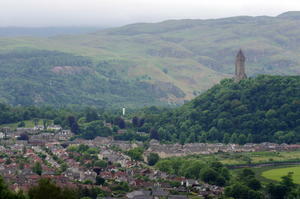 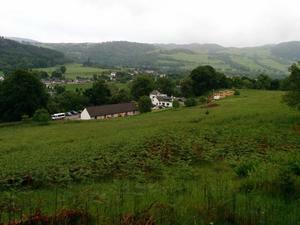 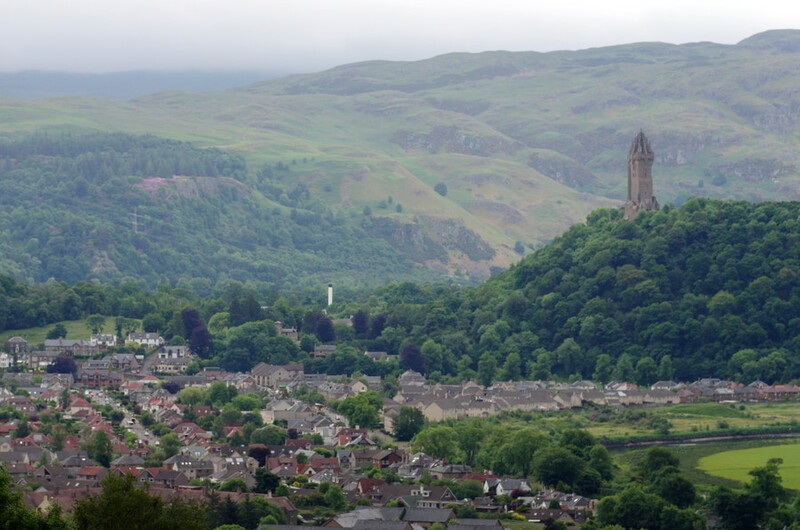 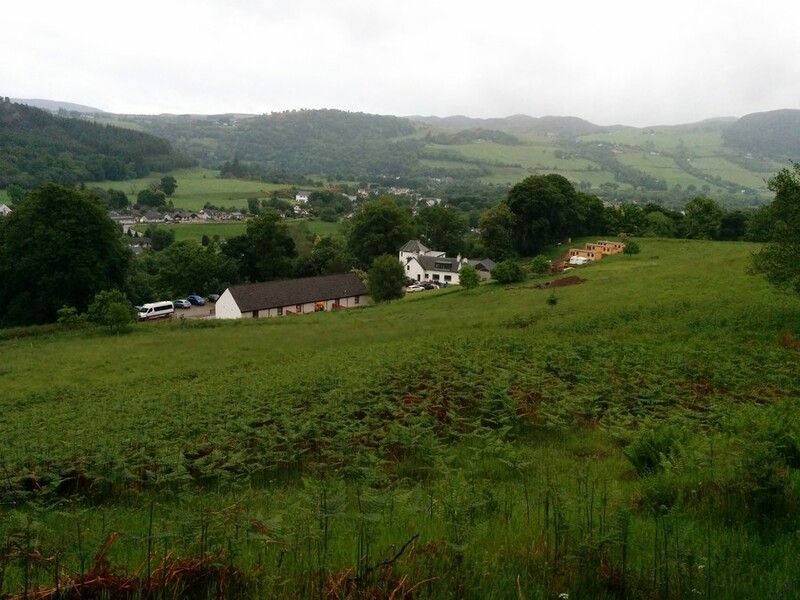 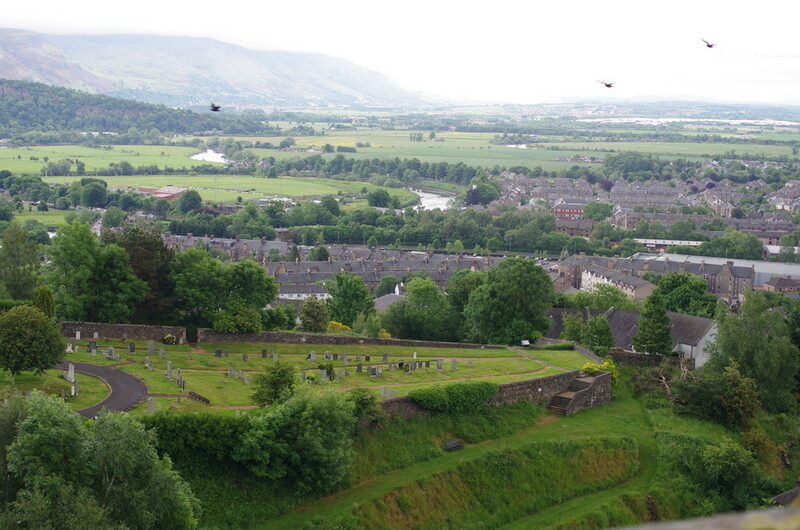 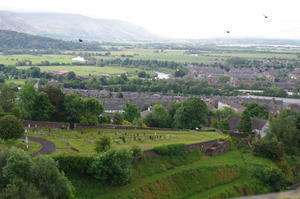 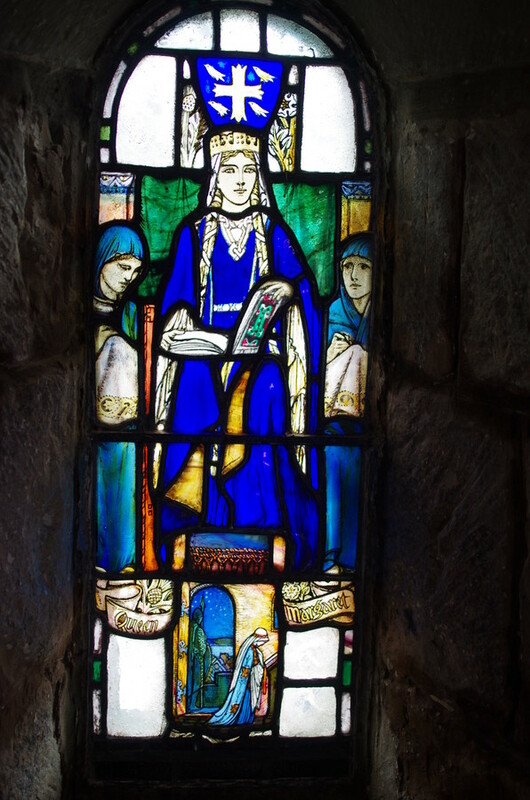 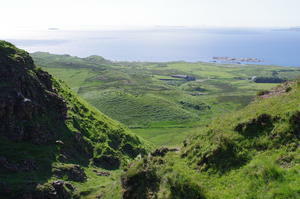 The monument on the hill is for William Wallace and his defeat of the English in 1297. 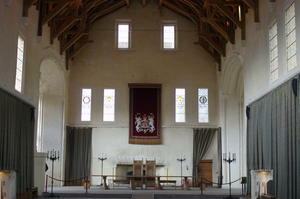 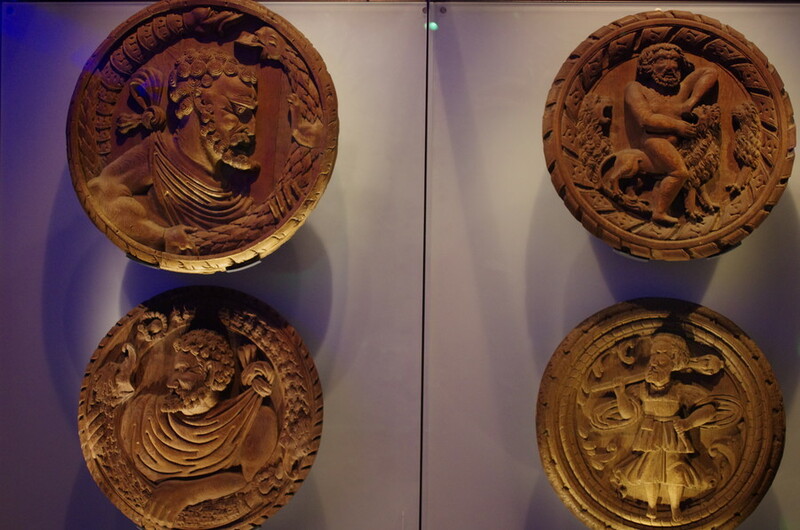 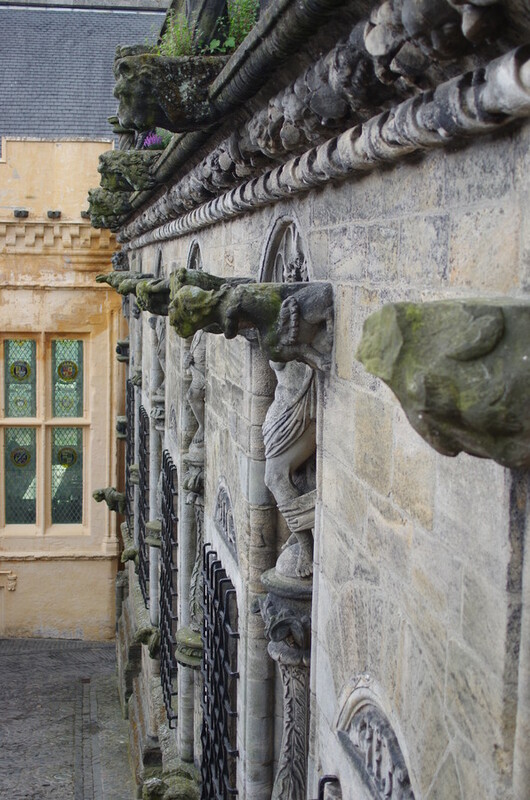 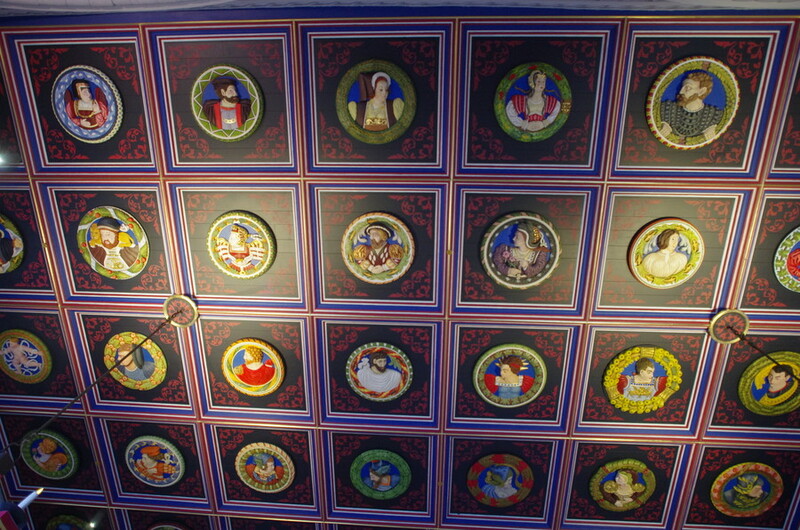 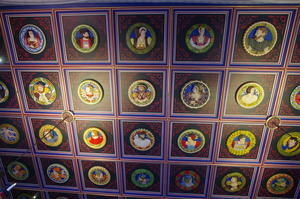 Stirling Castle houses the Stirling Heads Gallery: large carvings of nobles, biblical and classical mythology characters which were inset into the ceiling. 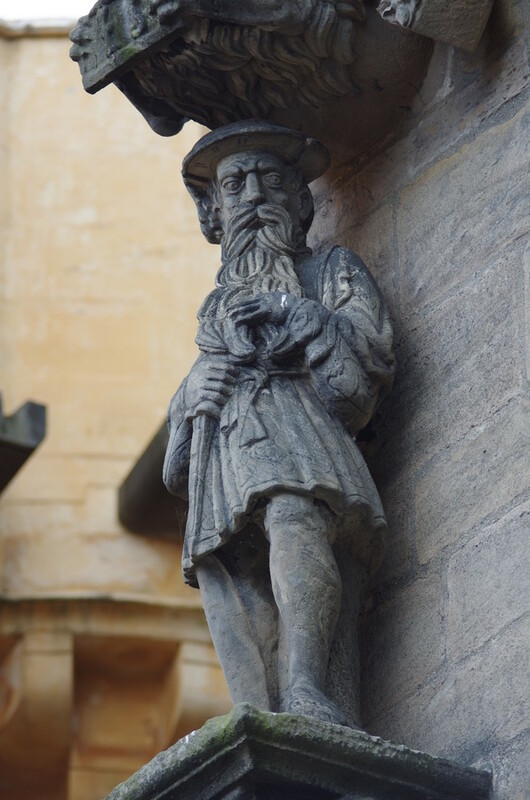 One of the topics noted in the audio tour of the castle is a fascination with the Greek, to point of this statue on the wall of one of the Kings James (the fifth?) with Greek beard to convey his wisdom. 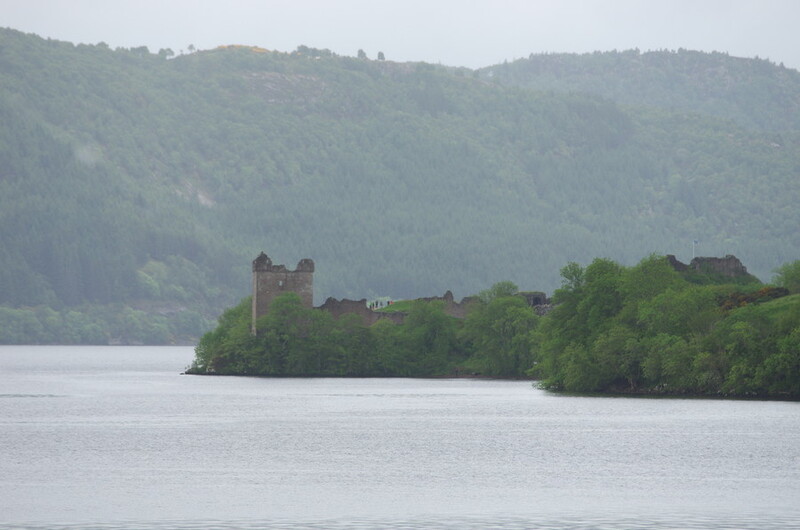 After Stirling Castle, we drove on to Kenmore for the night before touring the Scottish Crannog Centre the next morning. 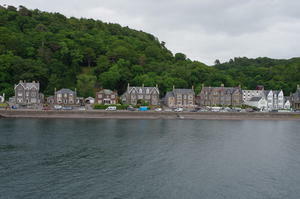 The Kenmore Hotel was the first of two places which didn't have any rooms with two beds; Robert had his own room there and in Fort William. 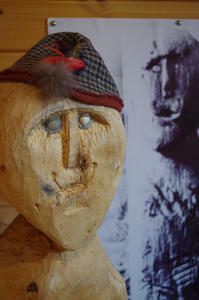 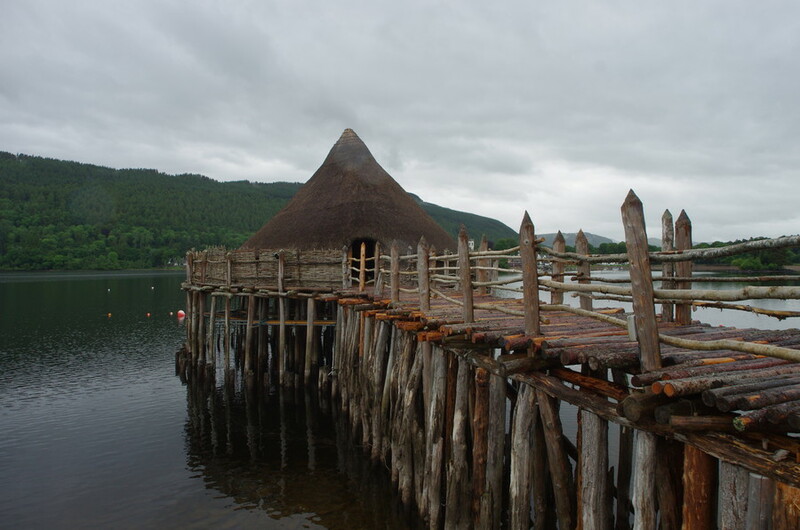 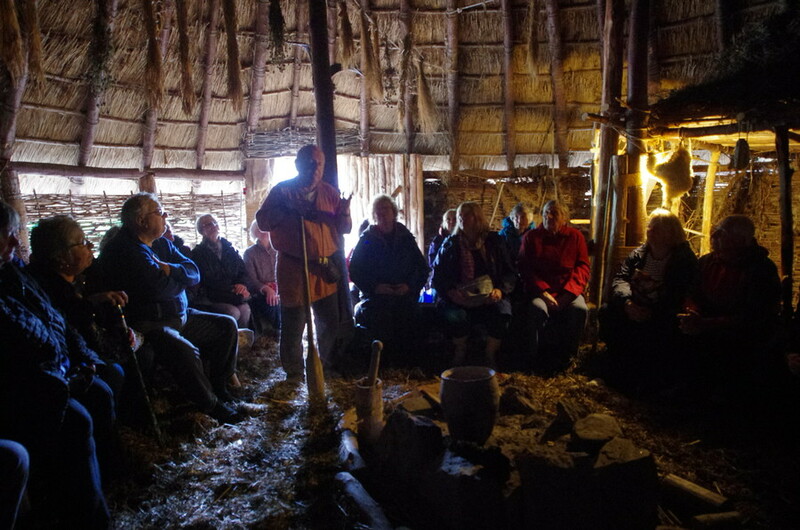 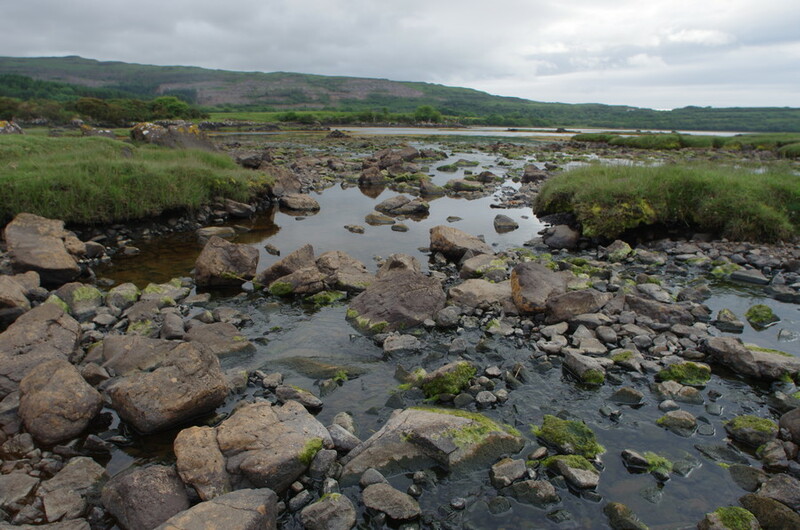 From the explanation at the Crannog Centre, crannogs may not have been part of David's 1976 tour as they weren't really known about then even though the crannogs, round wooden dwellings built just off shore in Scotland's lochs, were in use for thousands of years. 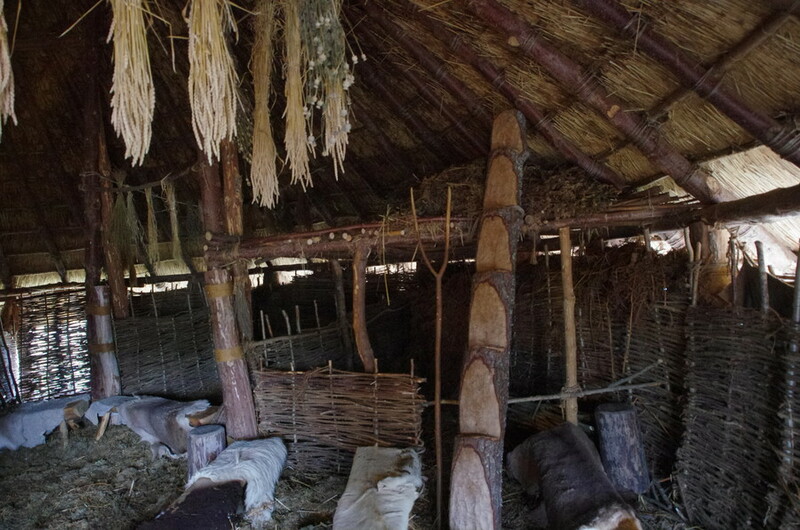 The Crannog Center has rebuilt one using period techniques and mostly period materials (with some required safety improvements). 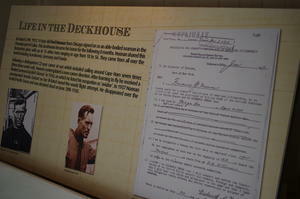 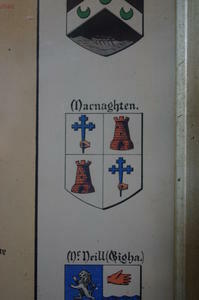 The dwellings were thought to house extended families of 15 - 25 folks. 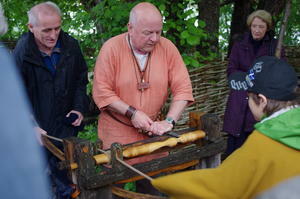 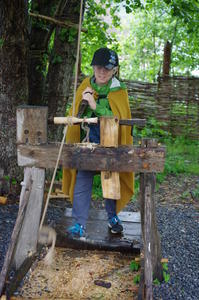 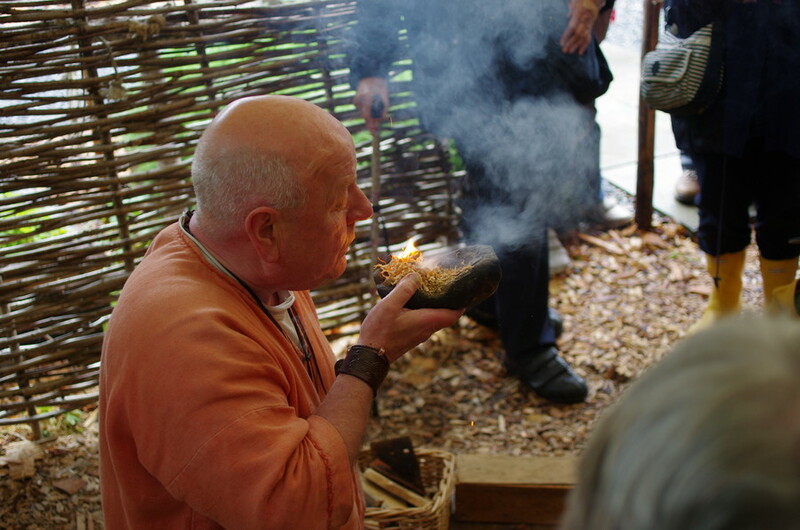 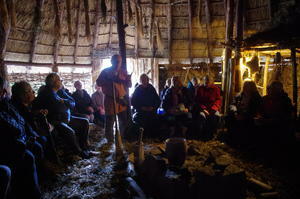 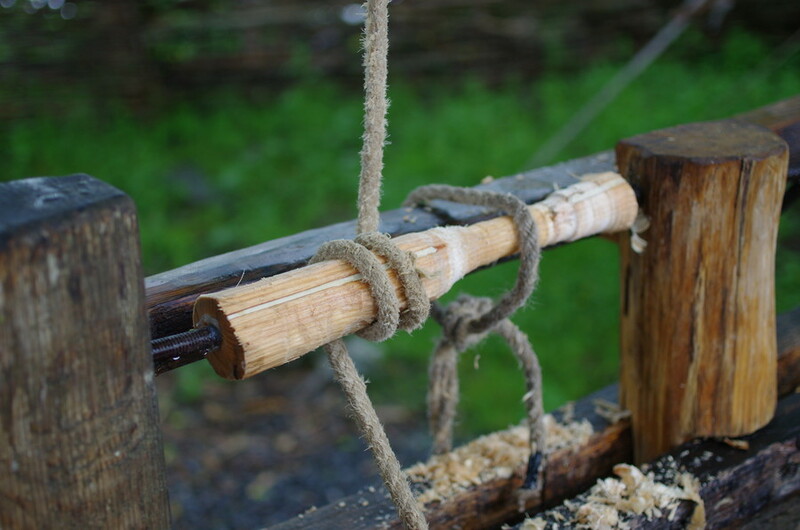 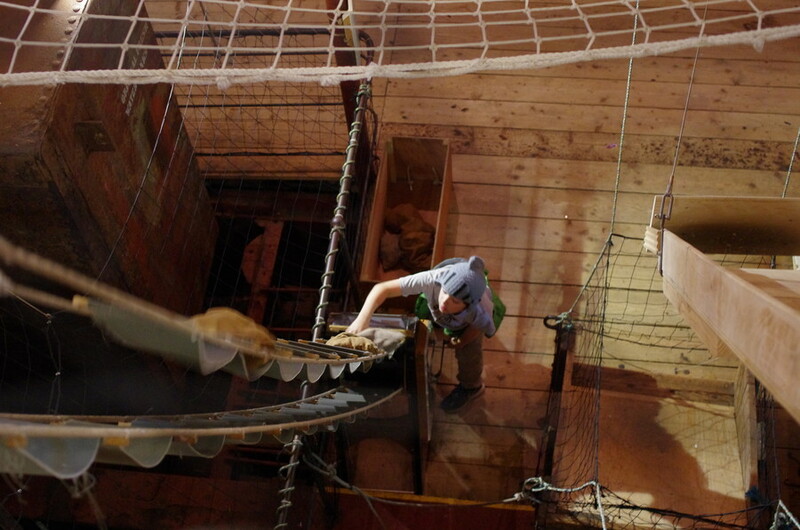 The centre also demonstrates period technology: human powered lathes, drills, grinding stones. And our guide showed off his fire making skills with a bow, stick and dry kindling. 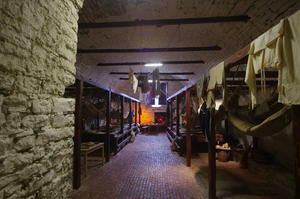 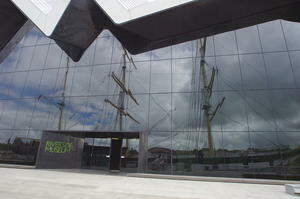 It was a fascinating tour and again, the depths of the history is impressive to us new world "yanks." 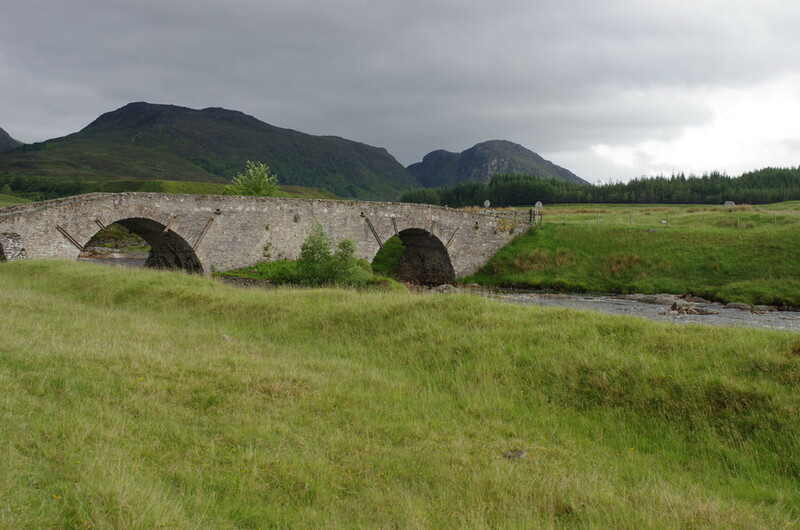 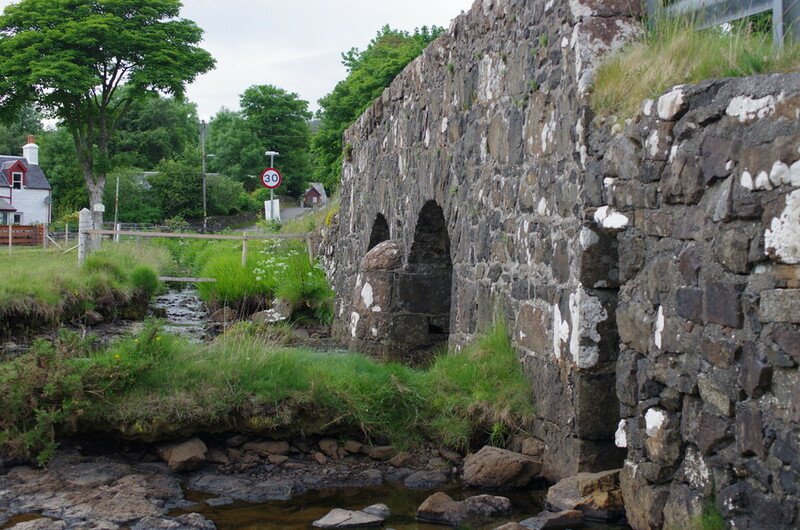 David took us on a side trip on our way from Kenmore to Urquhart Castle: one of the paper maps we took with us mentioned standing stones down this small road... We didn't find the standing stones but the road ended at this beautiful bridge and field. 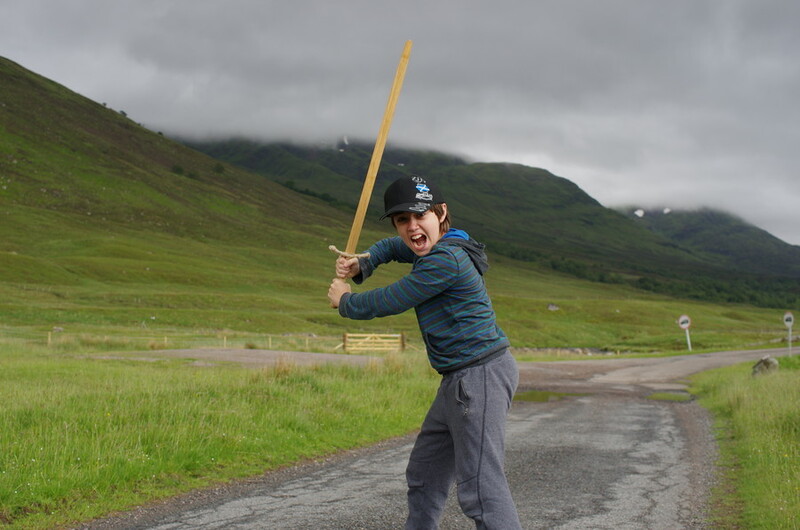 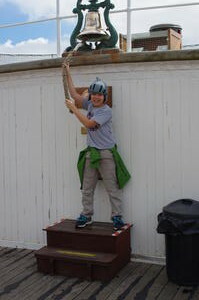 It gave us a chance to get out and stretch our legs (and Robert to get a feel for his souvenir sword). 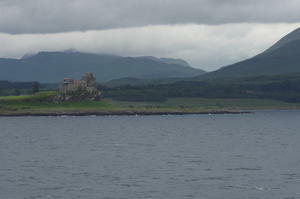 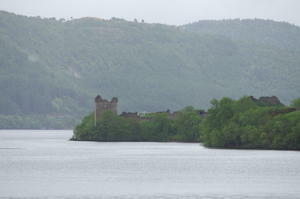 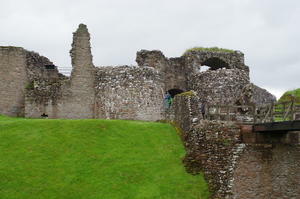 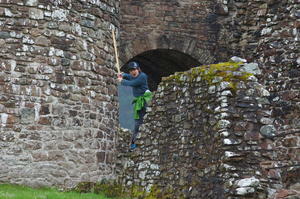 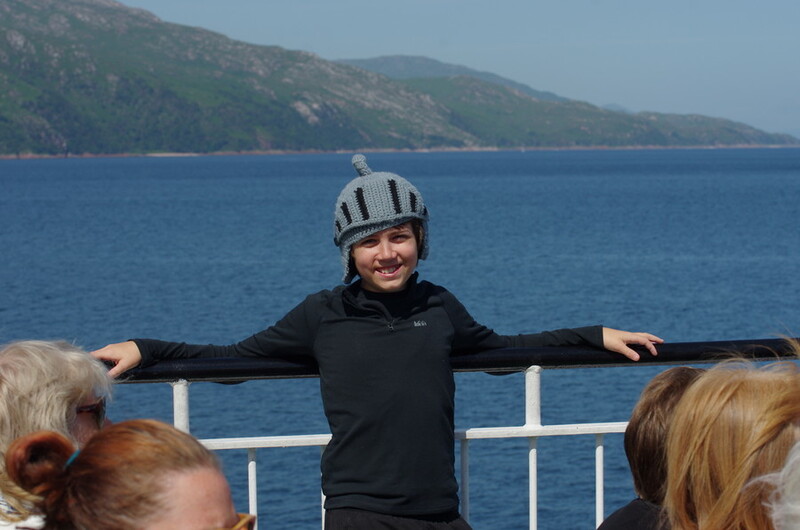 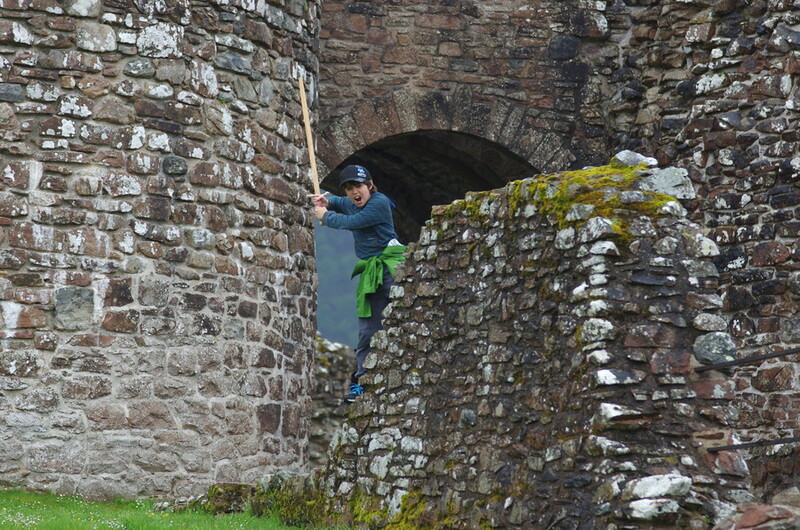 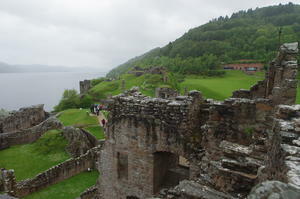 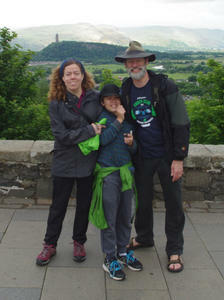 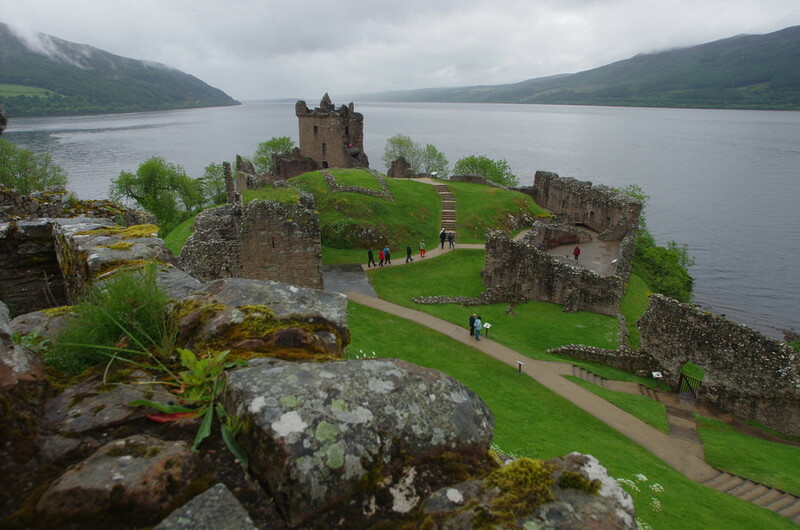 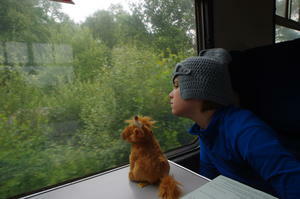 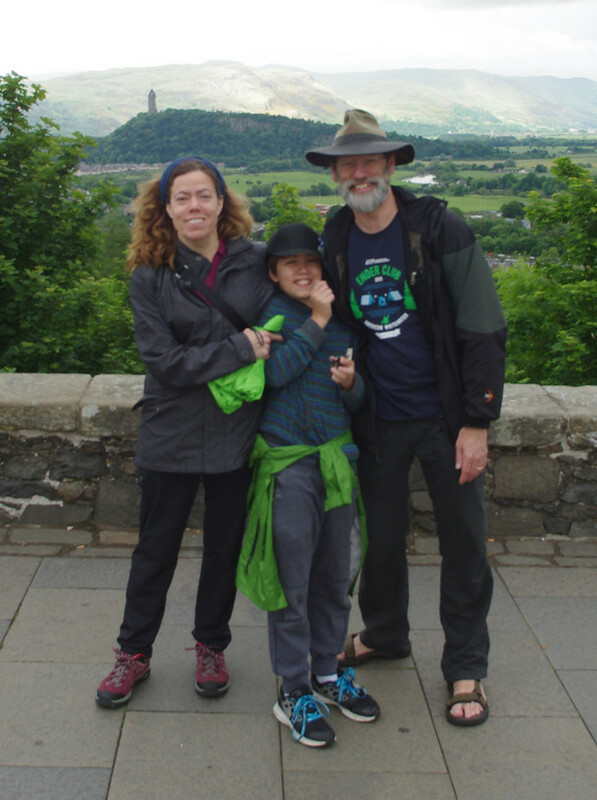 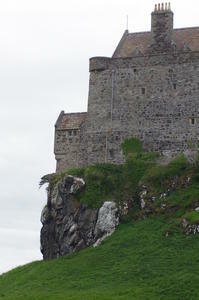 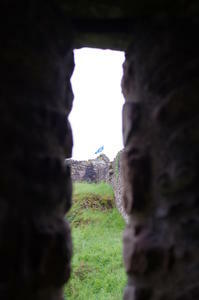 We continued on around the south western edge of Loch Ness (with an eye open for monsters) and up to Urquhart Castle. 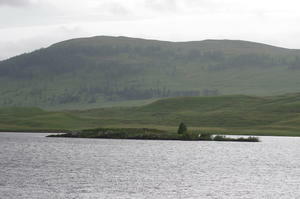 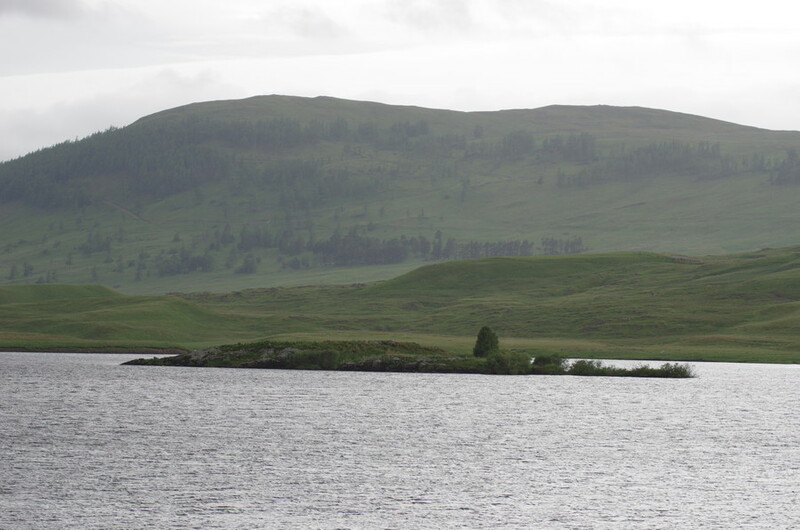 Every small island in the lochs we drove past seemed like a crannog after our tour in the morning. 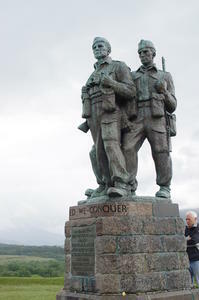 And we stopped by the commando memorial (as David did in 1976) before pulling into the Urquhart Castle parking lot (too late to get into the castle that day). Note: the picture of Sarah driving is one one of the main roads in Scotland -- there were some highways, but most of main roads were two lane often with little or no shoulder. 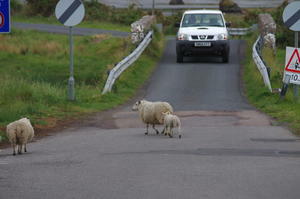 The one lane roads were often spectacularly narrow. 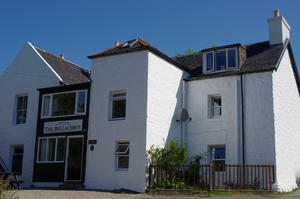 We spent the night at the Clunbeg Lodge, just a little ways from Urquhart to make getting to the castle the next morning easy. Urquhart was a high point for David on his earlier trip and it was a high point of us on this trip as well. 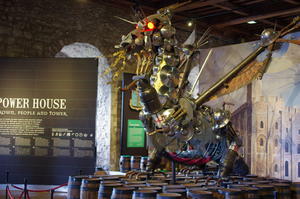 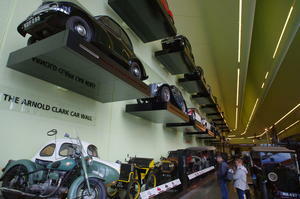 They have new visitor center with an interesting movie about the castle and it's history. And we were able to catch up with guides on several occasions to listen in as they talked more about it. 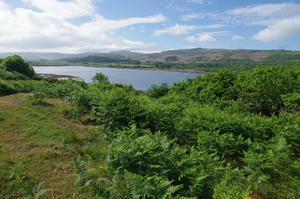 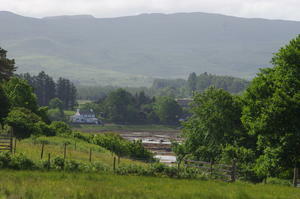 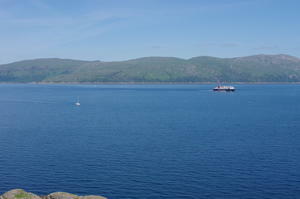 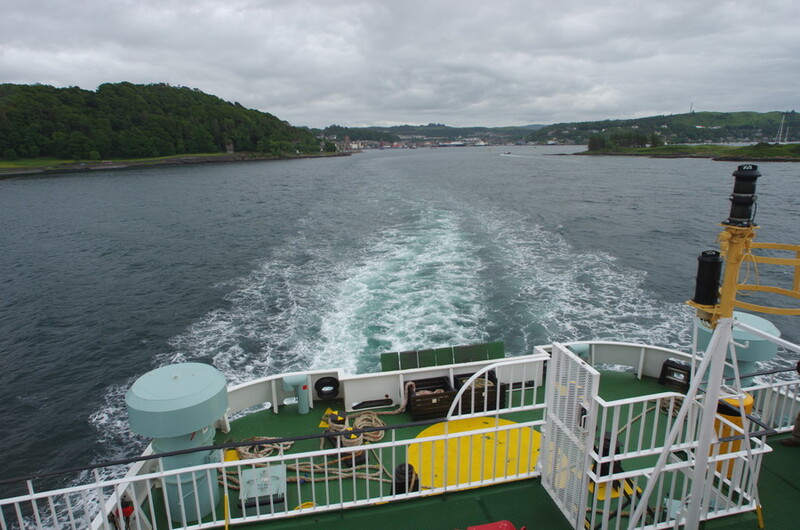 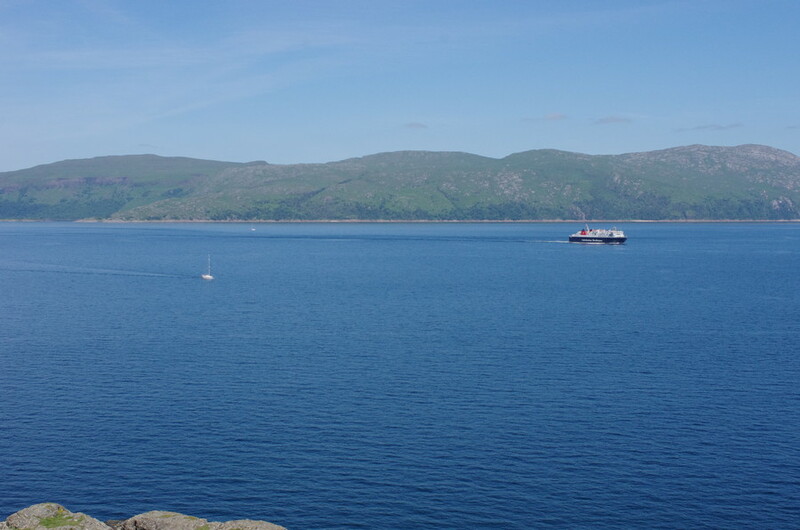 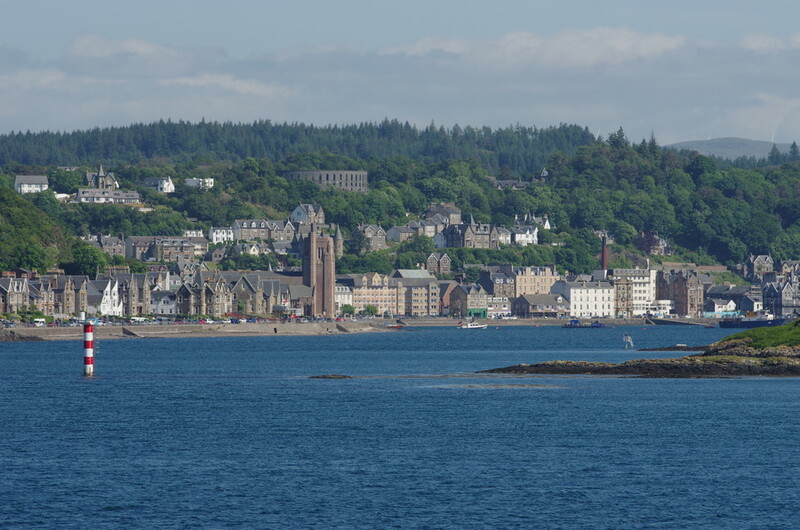 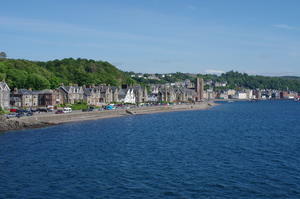 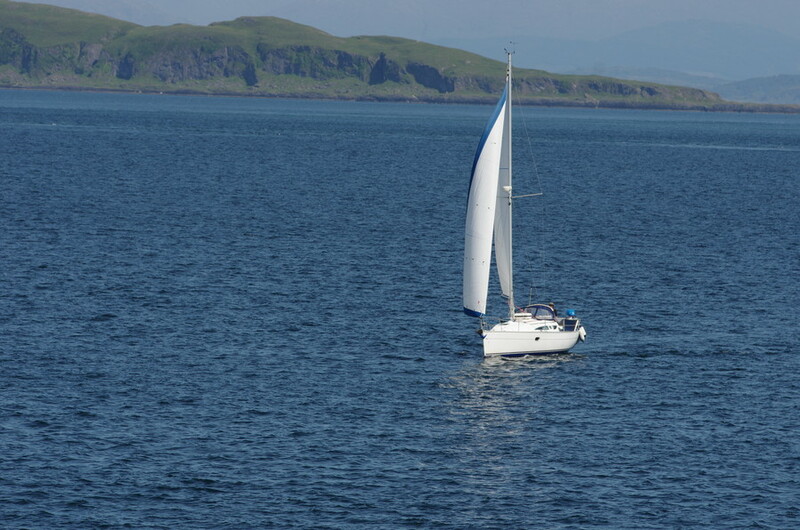 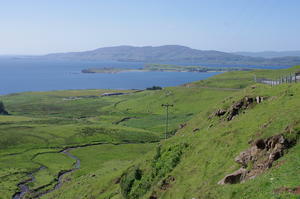 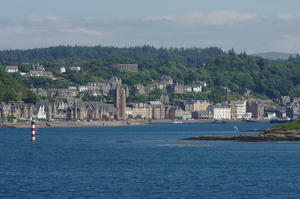 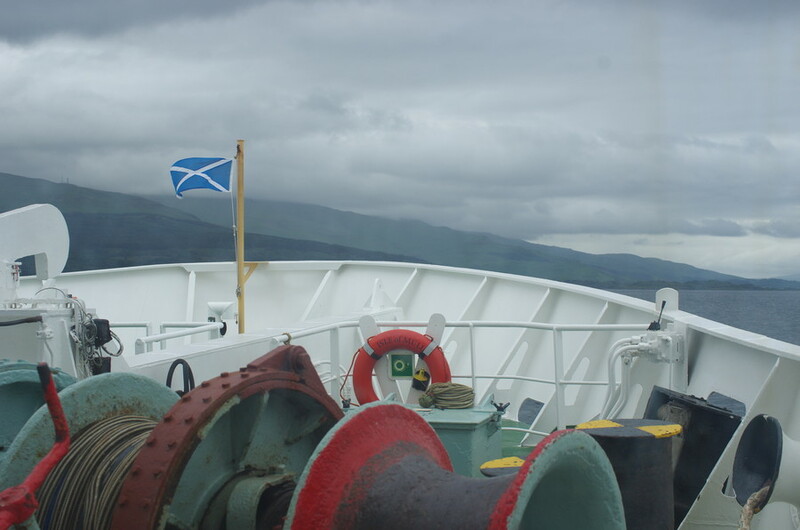 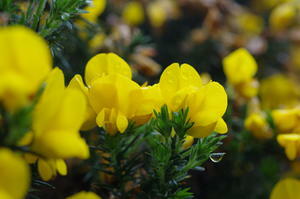 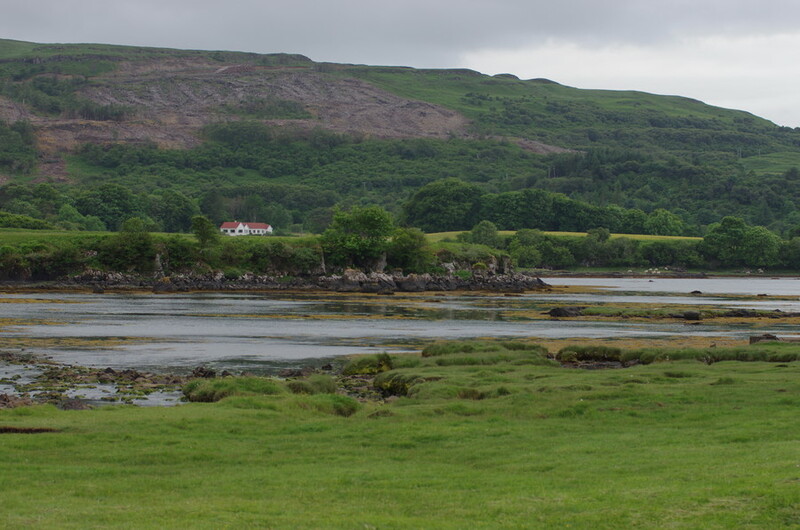 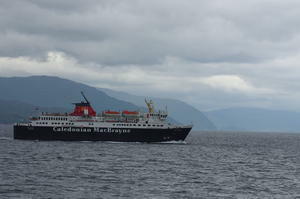 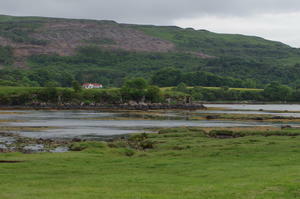 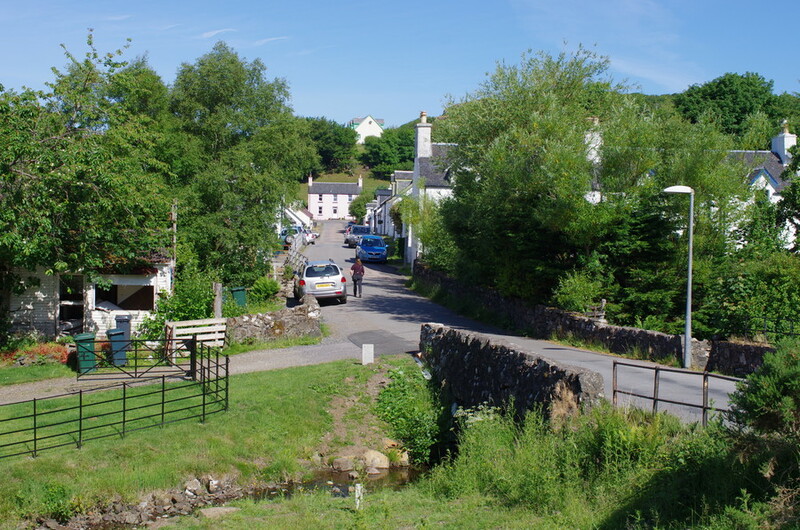 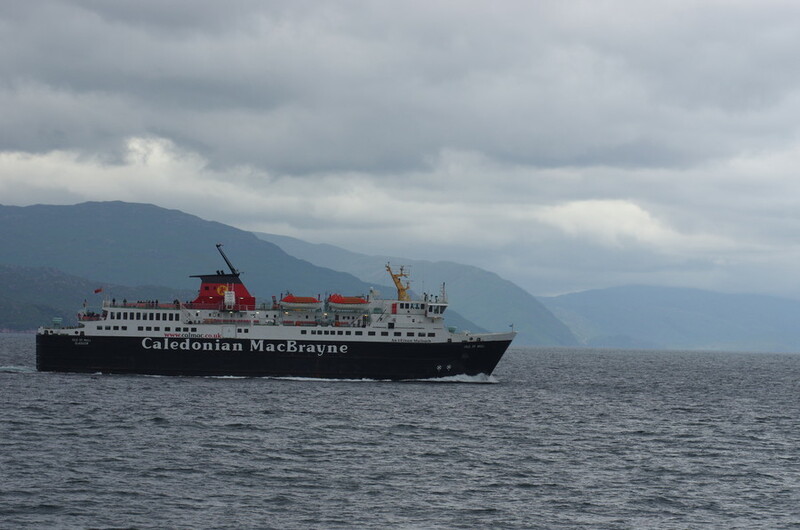 We drove from Urquhart to Oban and caught the ferry to Craignure on the Isle of Mull that afternoon. 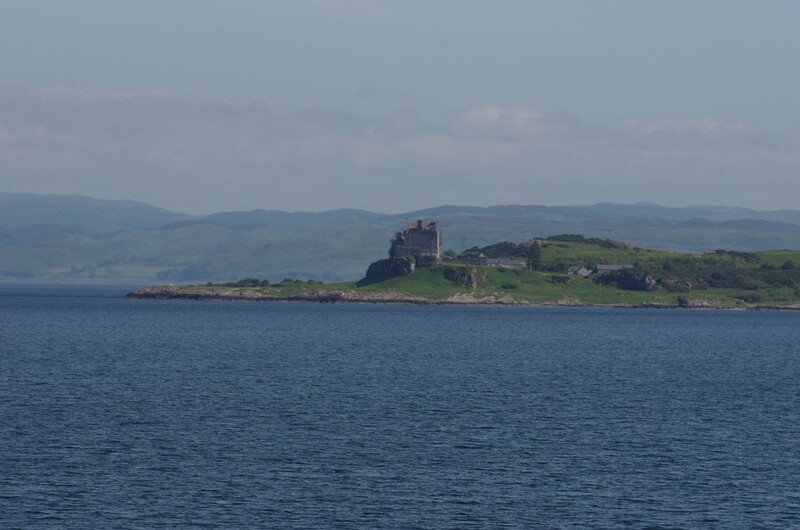 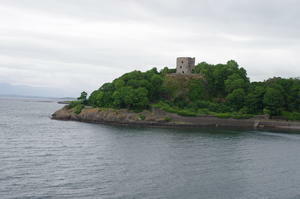 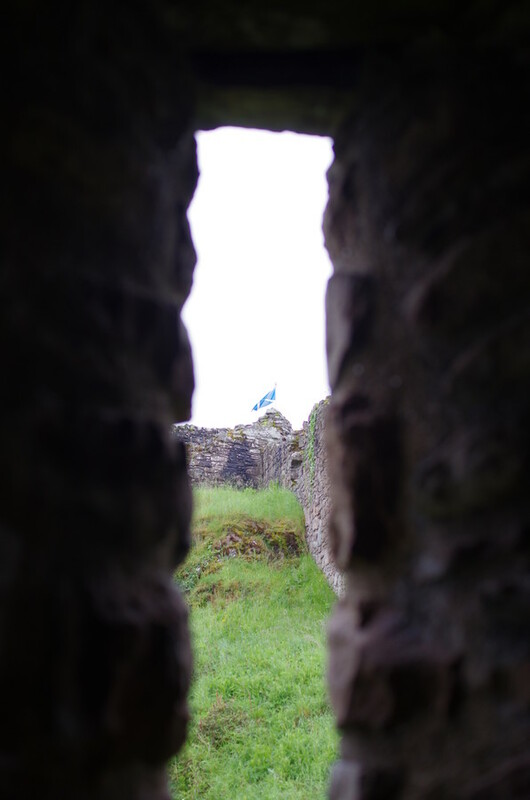 Going past Dunollie Castle , it was hard not to see the parallels to Urquhart (at least in the commanding view of the waterfront and square tower). 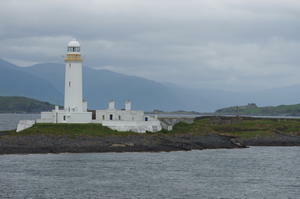 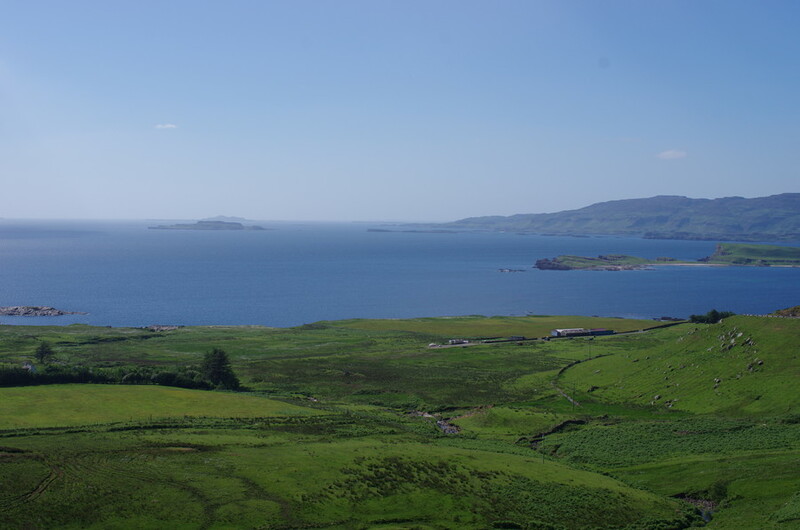 The light house is on Eilean Musdile, a small island off the tip of Lismore. 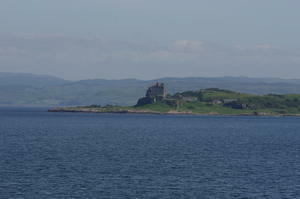 And coming into view after the light house is Duart Castle. 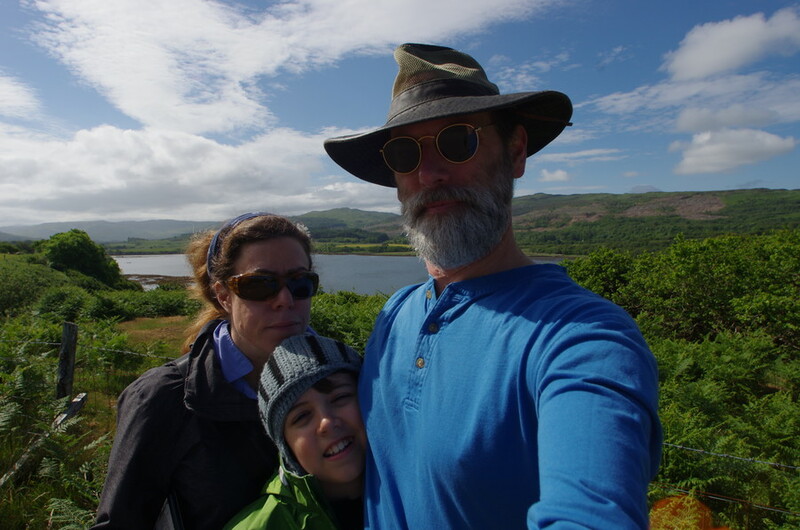 After the ferry docked in Craignure, we drove down to check out the grounds of Duart Castle — we got there about closing time so we just looked around outside. 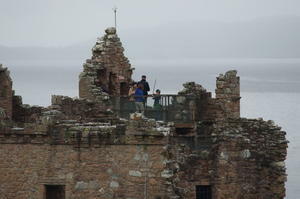 And plotted ways to storm the castle. From Duart Castle, we drove up to our next stop, the lovely Bellachroy Hotel (which has only been in business since 1608) in the town of Dervaig. 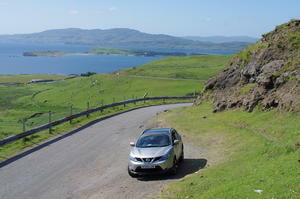 Another stunning spot. 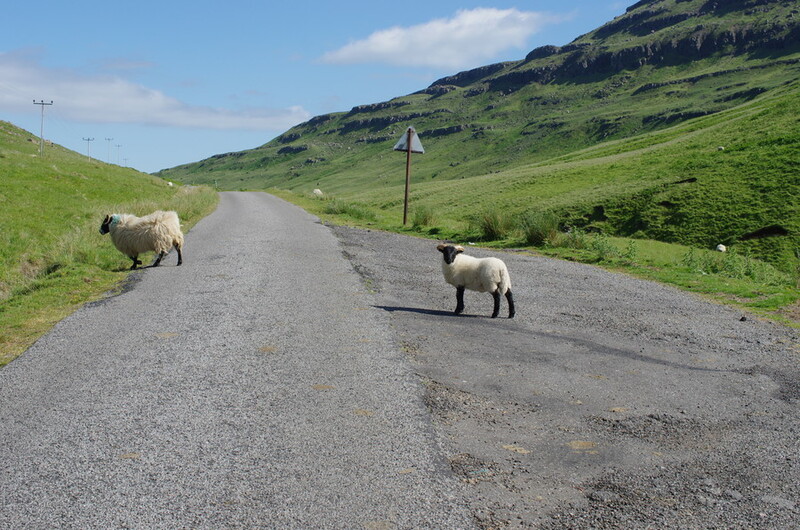 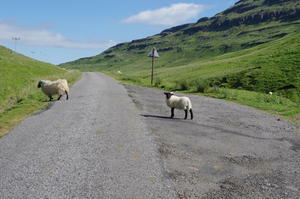 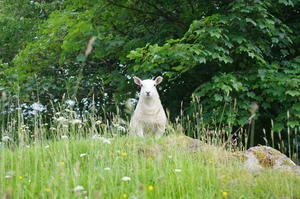 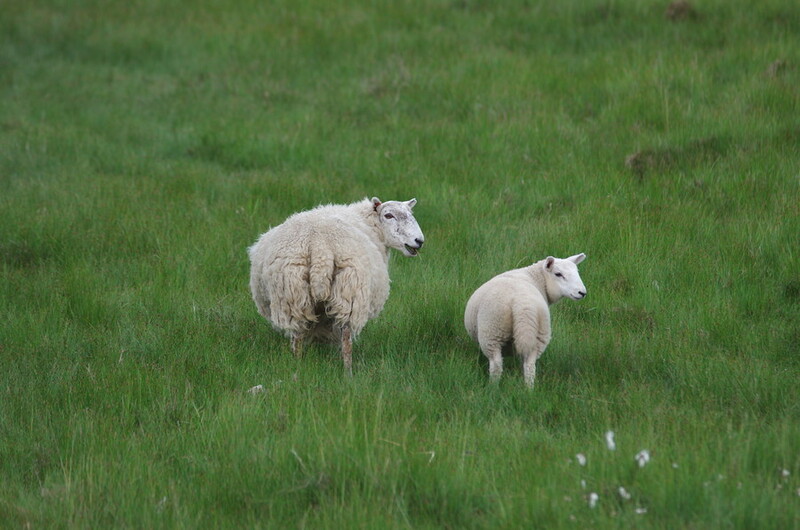 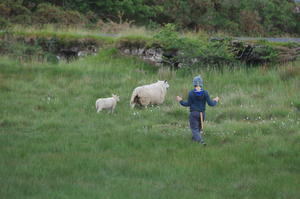 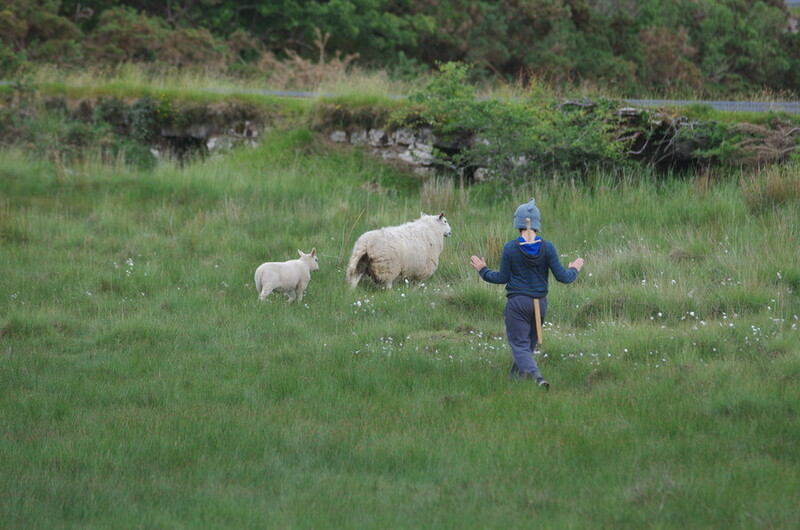 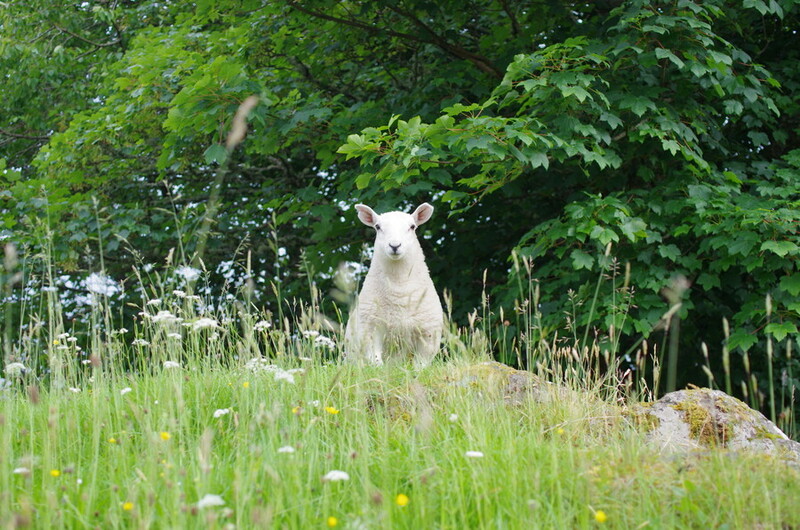 We introduced ourselves to the sheep, who seemed to run the town. The next day, we walked through the town (about 3 blocks long) and down a road that turned into more of a walking path along the bay and through the woods. The misty, rainy weather had moved on and it was a stunning day; perfect for leg stretching walk. The nice folks at the Bellachroy arranged a pony trek for us later that day. 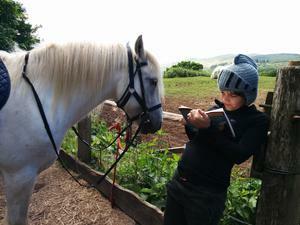 Robert was studiously reading his summer assignment as the guides saddled the horses for us. We're not sure how much the horse got from Robert's book. 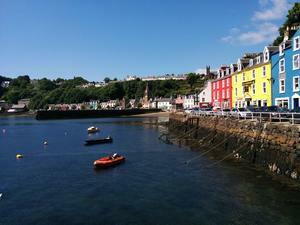 After the trek, we drove over to Tobermory. 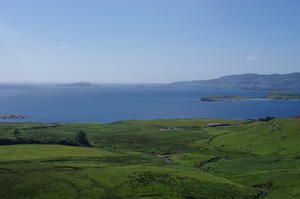 It was a beautiful drive across and up the island. 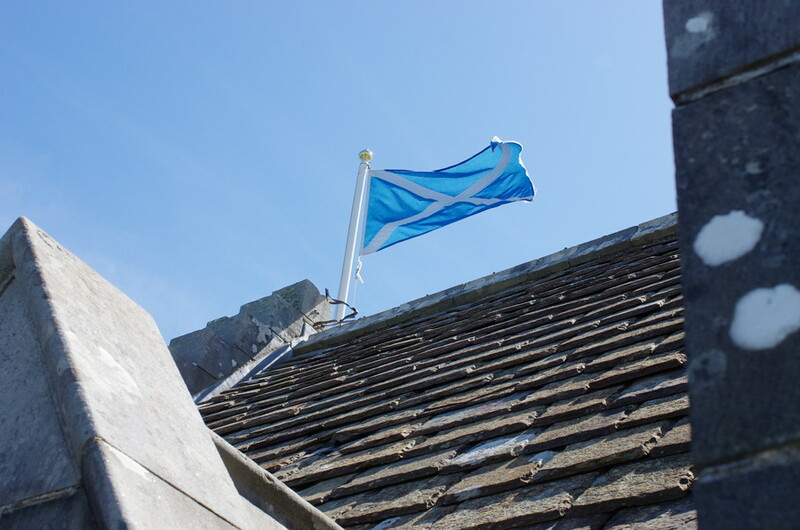 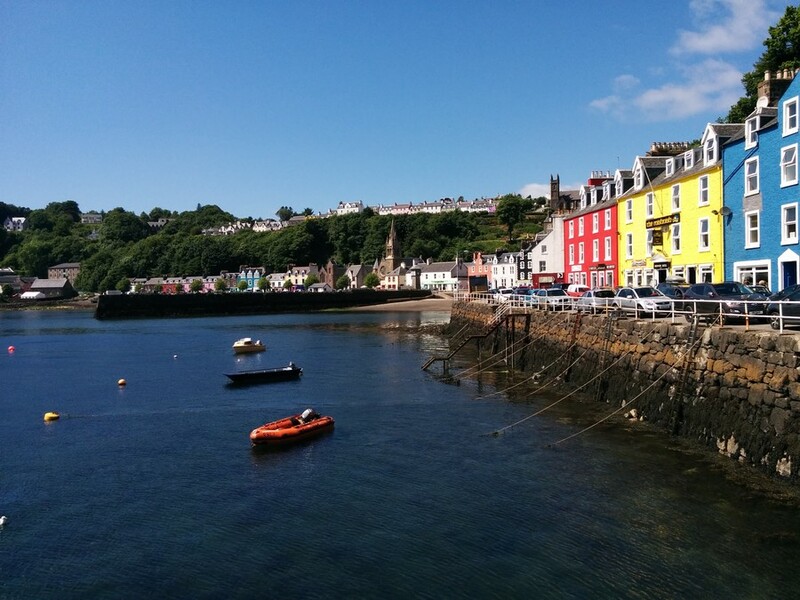 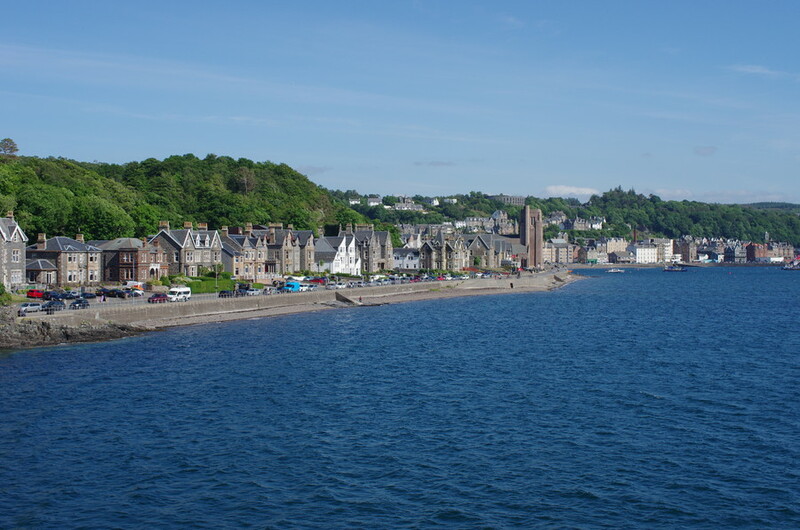 Tobermory is the classic Scottish coastal town and we were there on a fantastic day. We didn't get to go into McCaig's Tower, we didn't know it existed, but Sarah did catch the circular arched walls as the ferry approached. 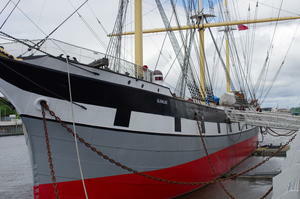 For Scotland, it's new, being built about 1900. 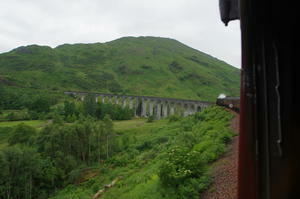 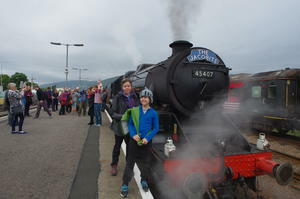 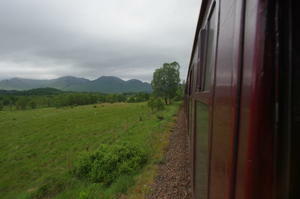 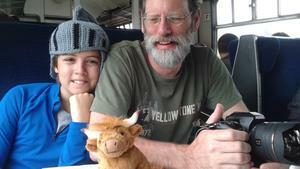 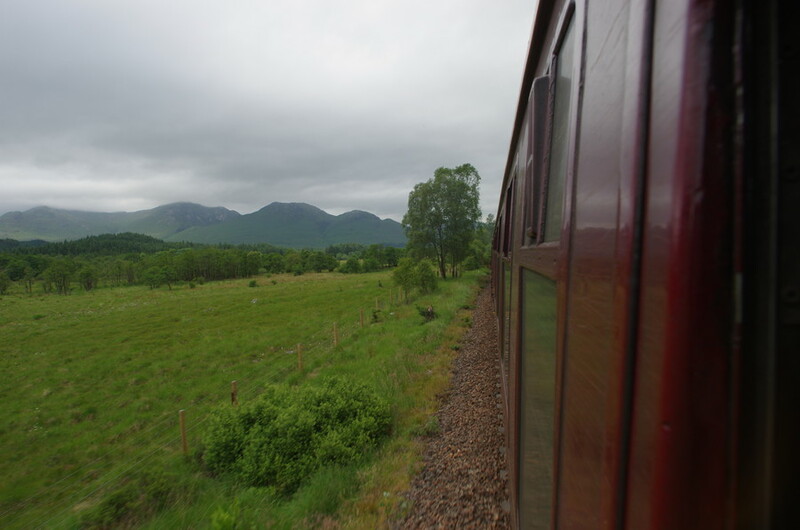 We headed to Fort William from Oban in order to catch the Harry Potter train to celebrate Father's Day. 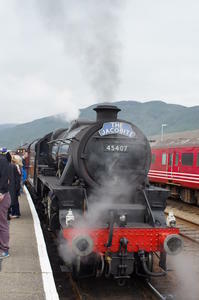 The Jacobite runs on the same route as the Hogwart's Express from the movies. 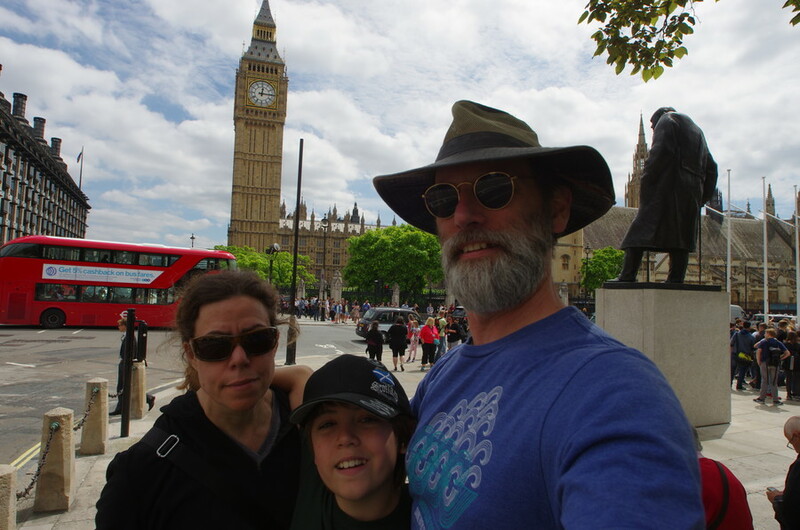 It was great way to spend Father's Day. 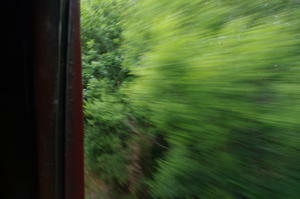 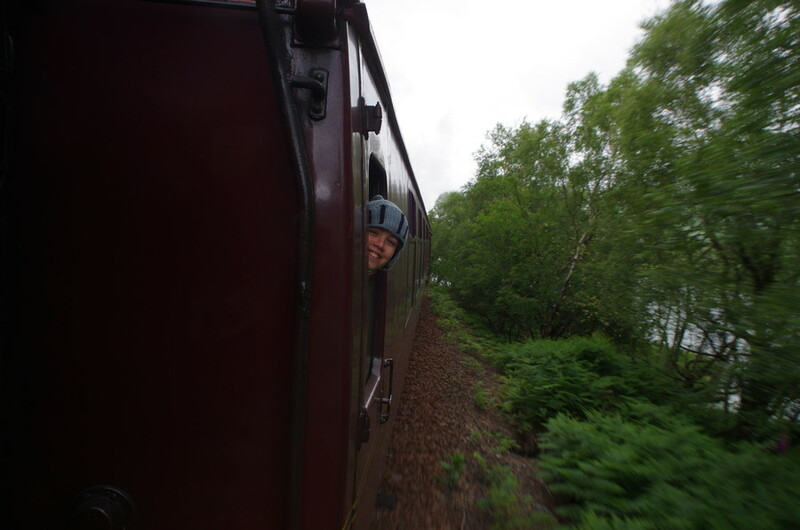 Don't try this at home: sticking your head out the window of a moving train is not recommended. 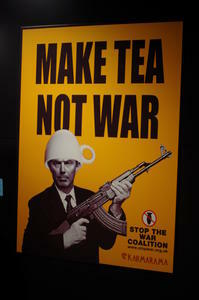 But it makes for good pictures (as long as no one is hurt). 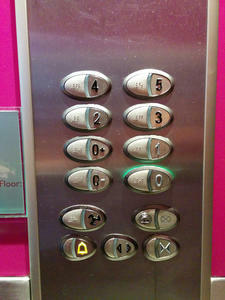 After the train trip, we drove down to Glasgow and saw this odd site in our hotel there: 0 as the ground floor makes sense and 1 as the floor above makes sense (even if we'd refer to it as 2). 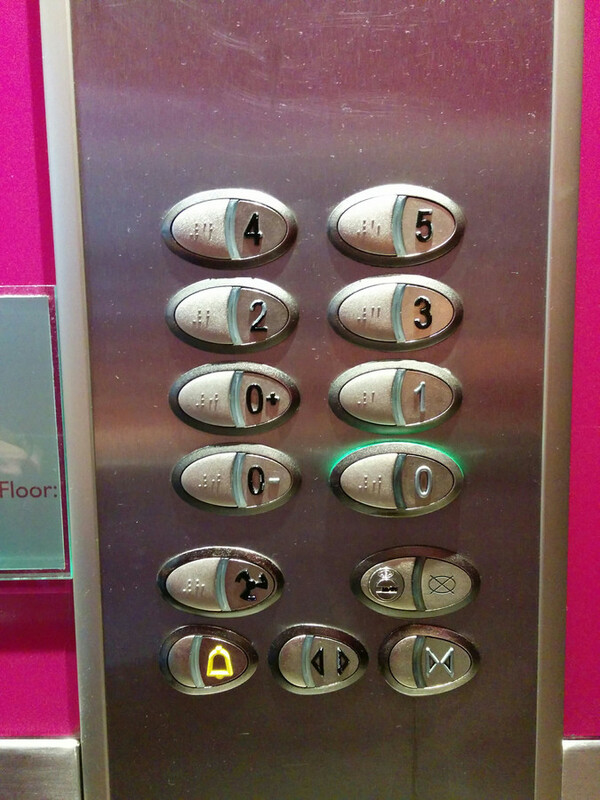 But what happens on 0+ and 0-? 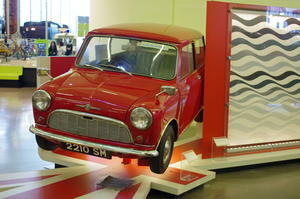 David had to take a picture of this Mini because it's much like the one his Aunt and Uncle had when they lived in Edinburgh for his earlier trip. The cars and trucks and buses were fun (and Sarah found a very cool street scene) inside; the Glenlee was at least as cool outside. 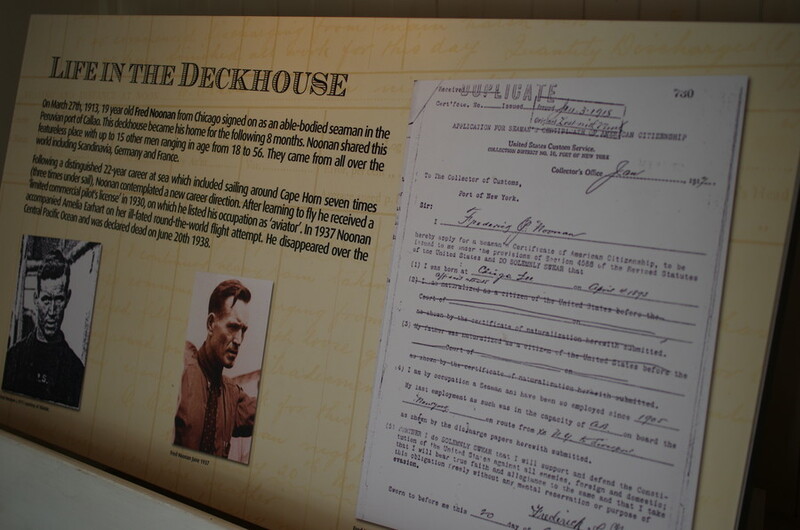 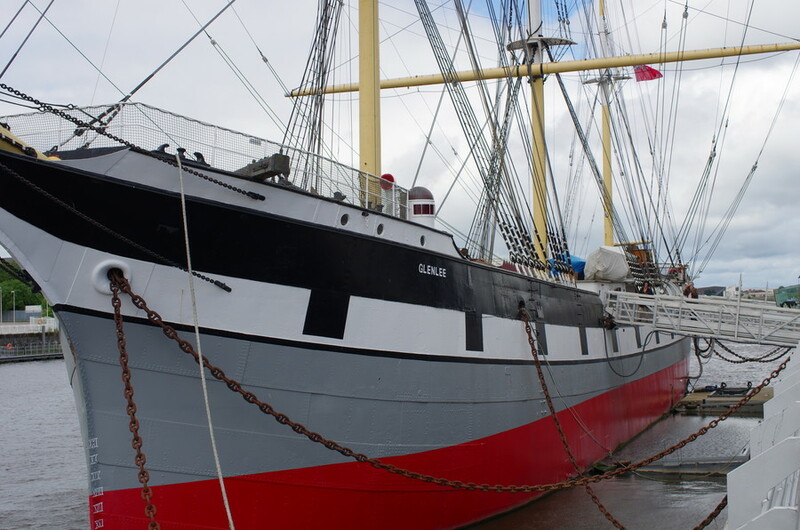 This seemed interesting recent history: Fred Noonan signed on to to the Glenlee in 1913 — the same Fred Noonan who served as Amelia Earhart's navigator for her ill-fated round-the-world flight. 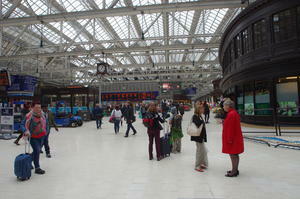 After the museum (where Robert is bringing up supplies on the conveyor belt in the photo on the right), we took a train (a fast train) from Glasgow's beautiful train station to London and our final Great Britain destination, The Georgian House Hotel. 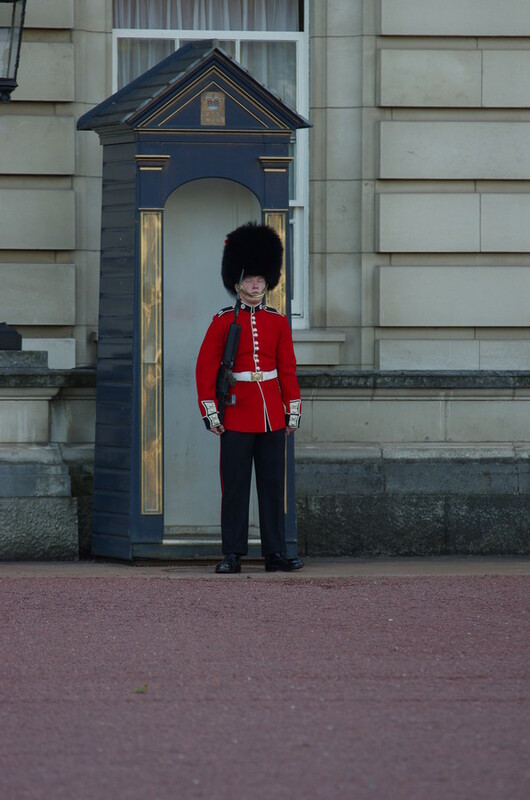 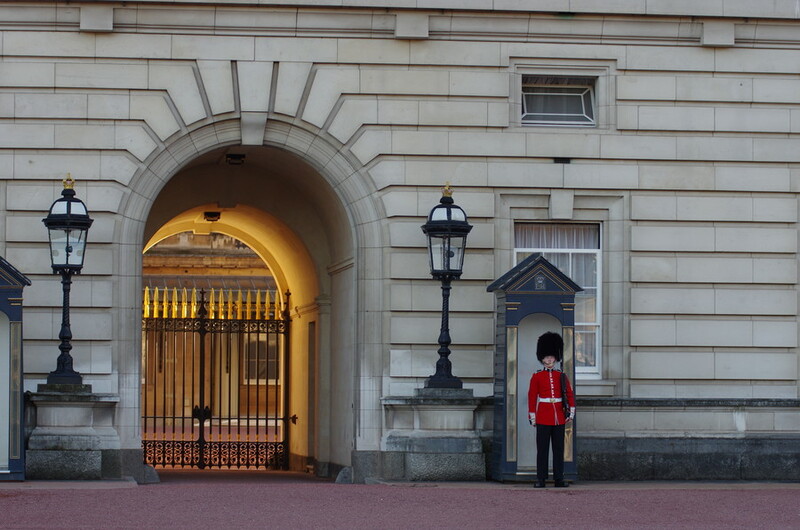 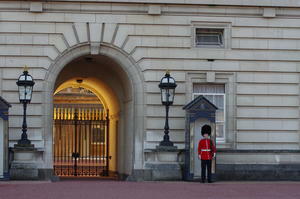 Another great location: after we checked in, we strolled over to Buckingham Palace. 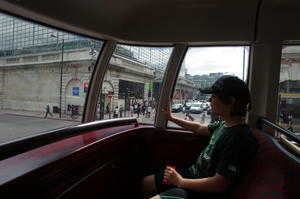 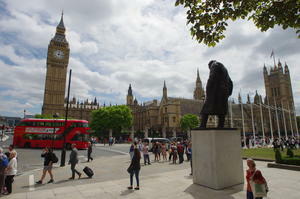 The next day, we hopped on a bus (a double decker, of course) and headed to the Churchill War Rooms. 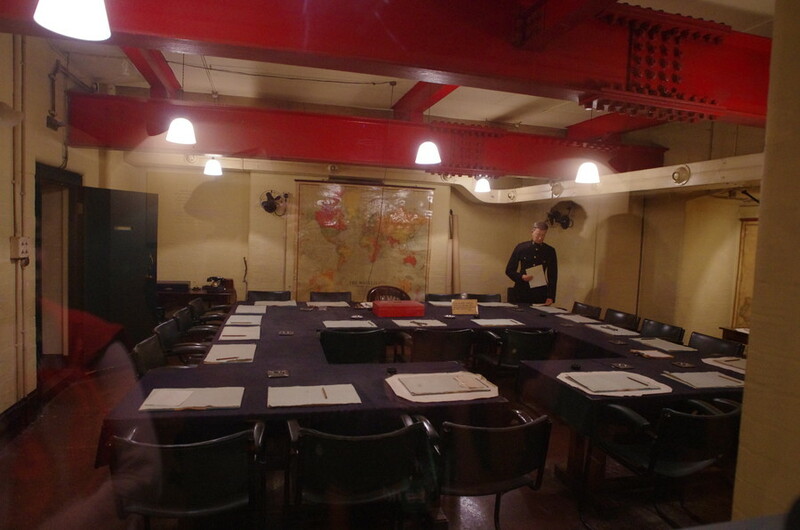 It really is hard to wrap your head around the fact that much of the Allies WW II action was planned in those cramped rooms. 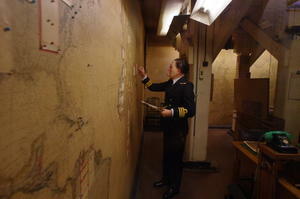 And that the maps of those plans were left just as they were at the end of the war. 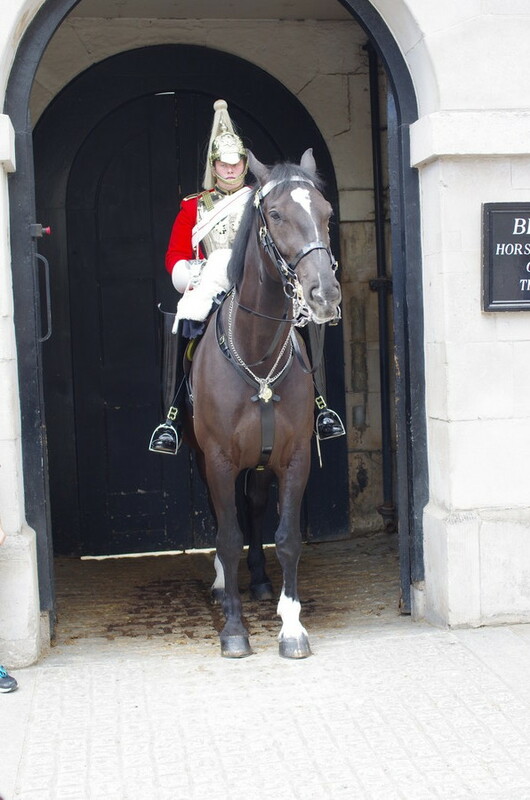 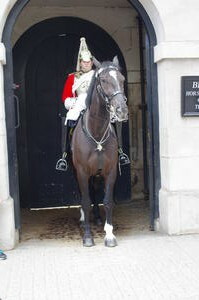 We wandered past the horse guards on our way to Big Ben and Parliament next. 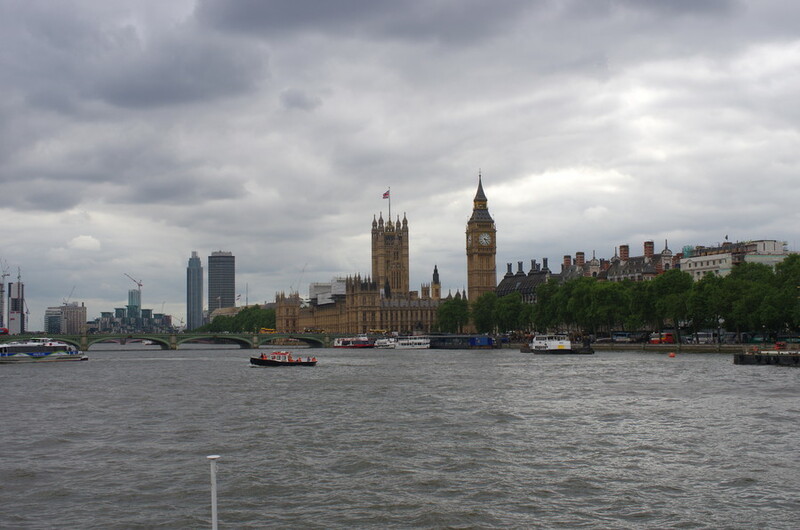 As we were right there, we caught a boat at Westminster Pier for a trip around the Thames (and we hopped off at the Globe Theater). The Globe tour was interesting and we were able to watch some of the rehearsal for Macbeth. 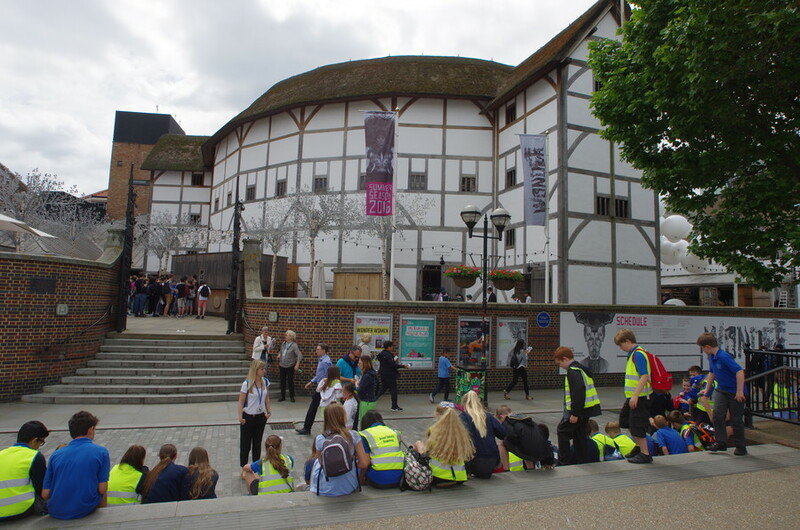 We didn't realize that the Globe was rebuilt (in a slightly different location) by an American who thought it a shame that all that was left of the original Globe as a plaque. 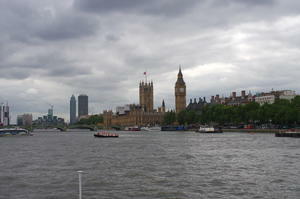 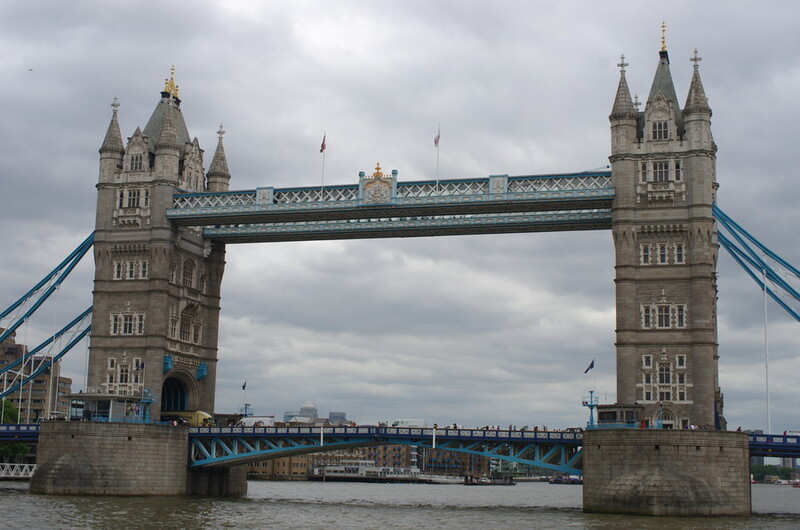 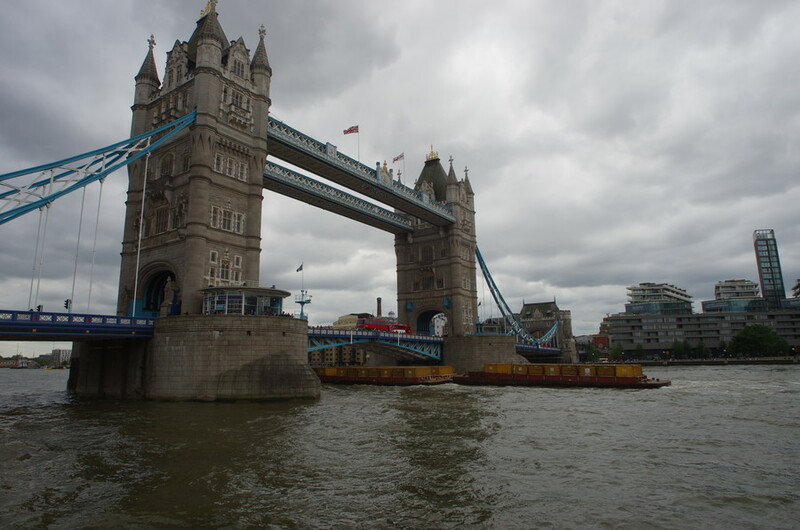 We finished our boat tour going by the HMS Belfast and the Tower Bridge. 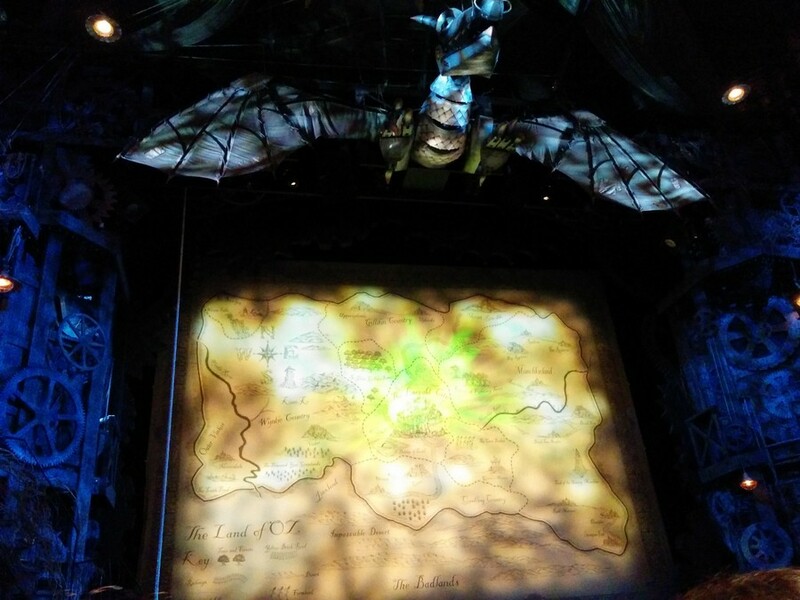 After getting back to the hotel, Sarah managed to score tickets to see Wicked; it was great! 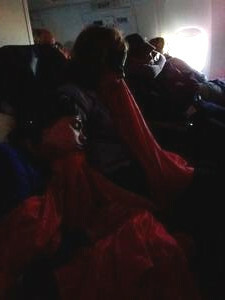 While we weren't front row, we were really close. This is the map of Oz and surroundings and the cool dragon that kept the audience company before the show started. 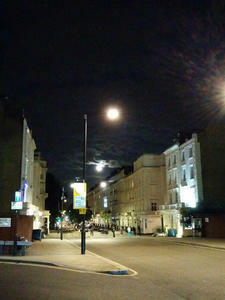 We walked back to our hotel under the solstice full moon. 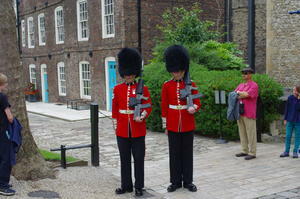 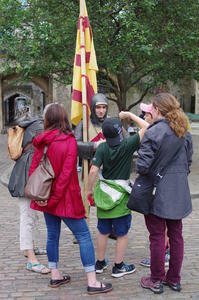 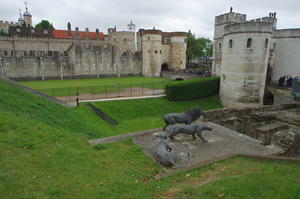 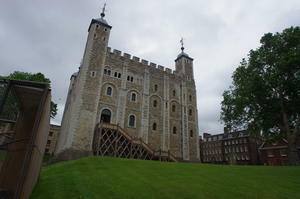 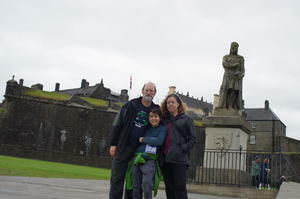 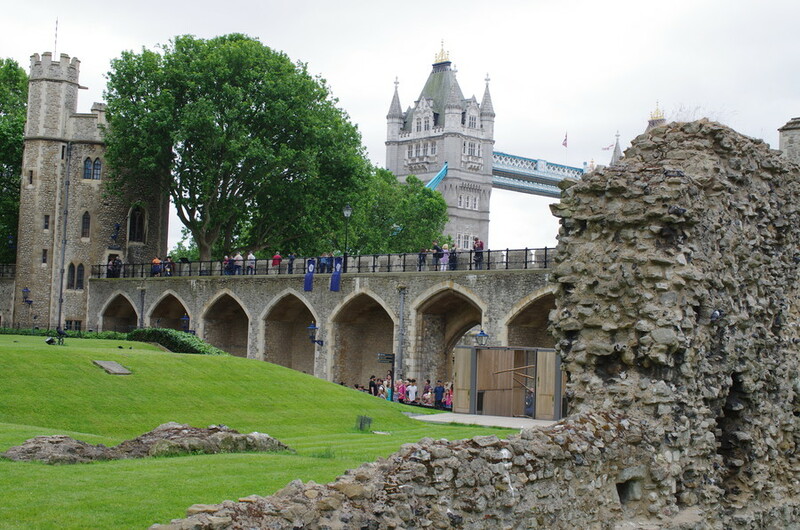 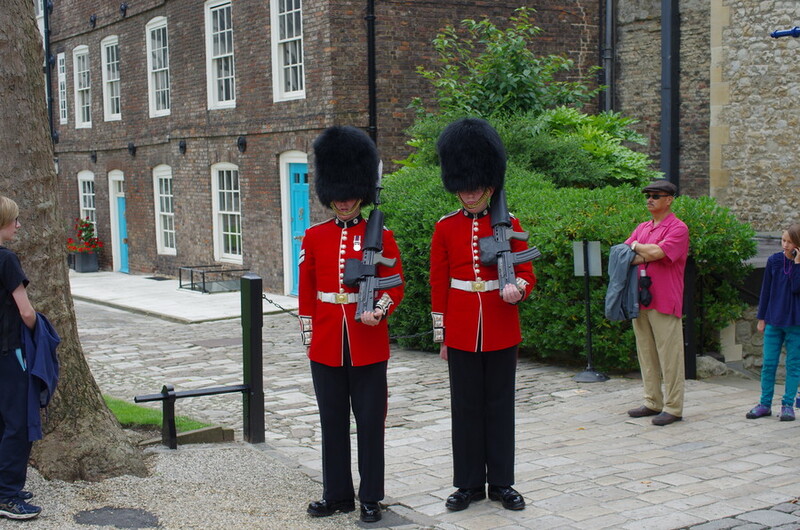 The next day, we caught up with Lynn and Sam for a Context Tour of the Tower of London. 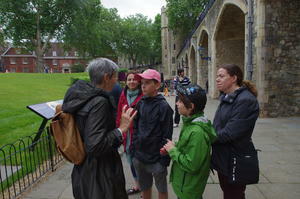 There was lots to learn and Both Robert and Sam (and their parent soaked it all in). 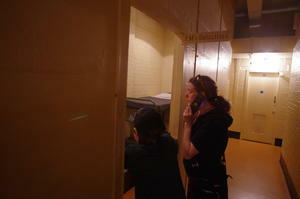 It's too bad David Z. had to work, I'm sure he would have been as interested as well. 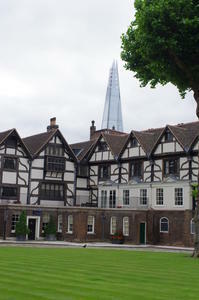 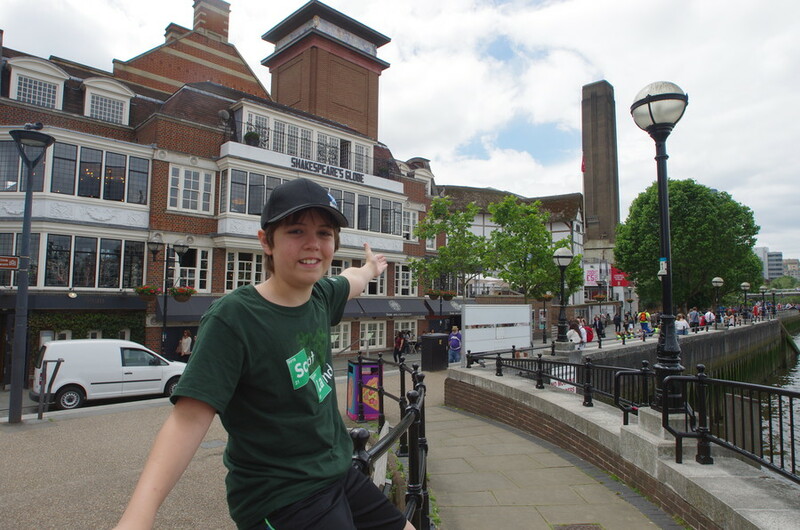 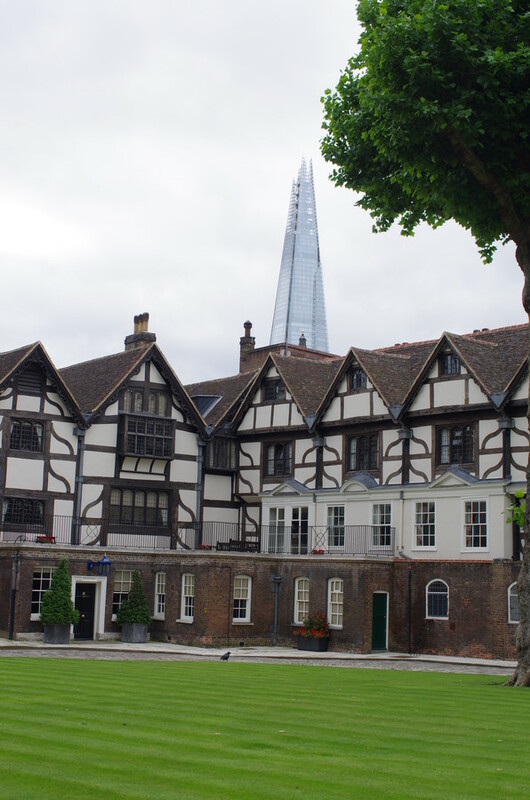 Sarah noted the juxtaposition here of the oldest part of the Tower with one of the newer additions to the skyline, the Shard. 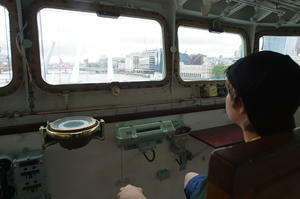 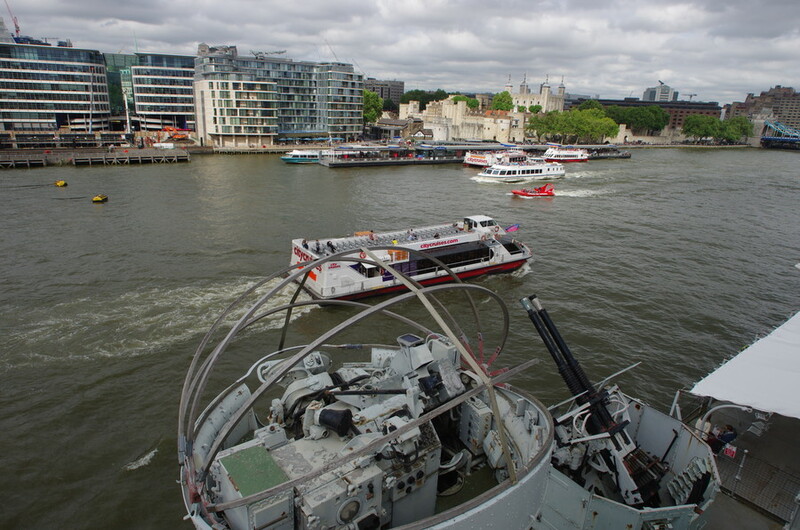 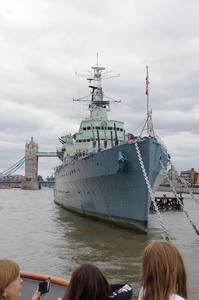 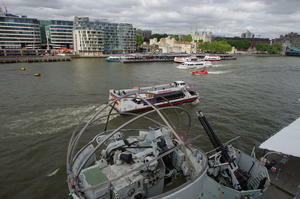 After the Tower of London tour, we stopped by the HMS Belfast at the recommendation of the tour guide. 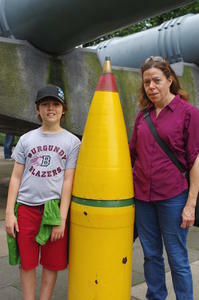 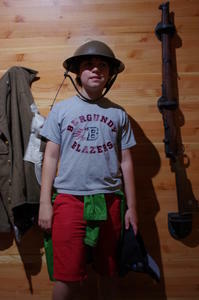 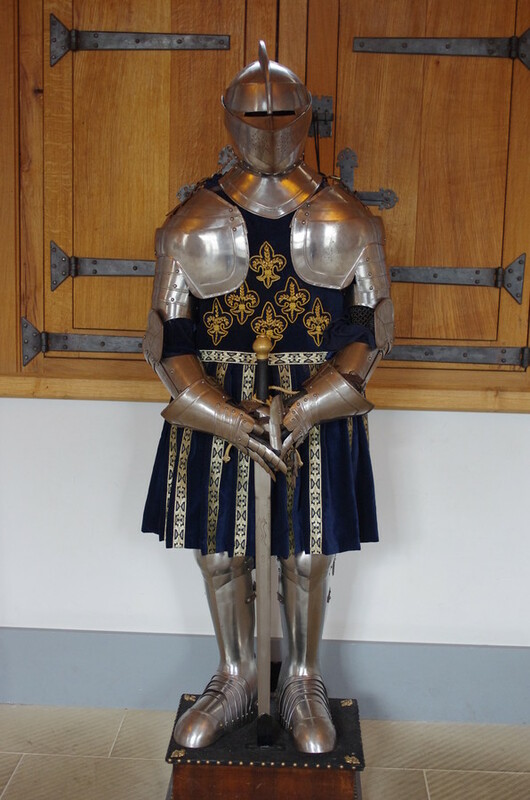 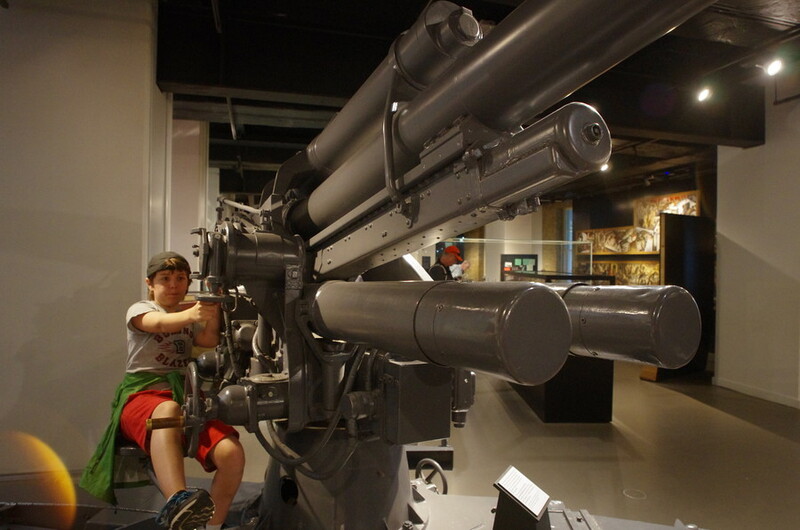 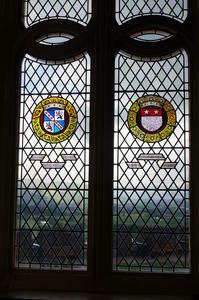 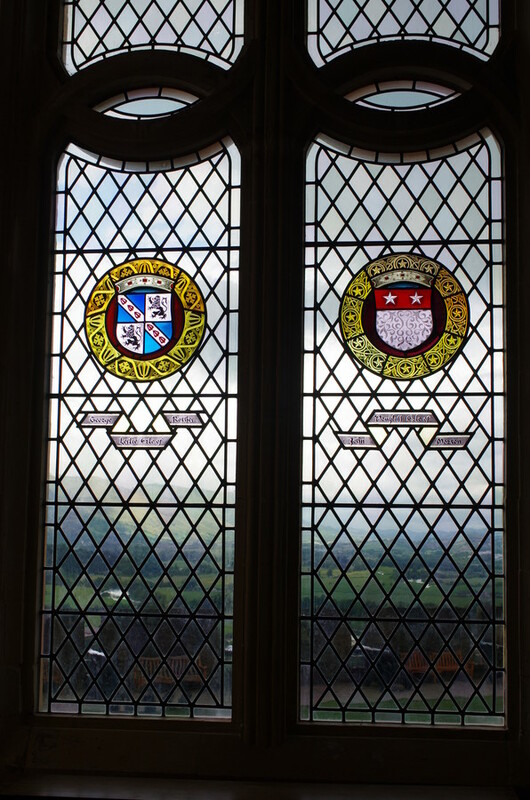 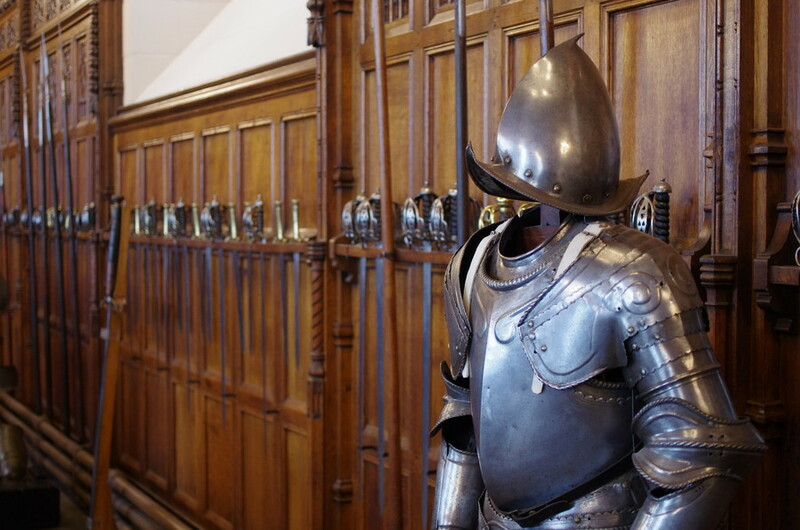 Sam and Robert really enjoyed the chance to see all the arms and armament. 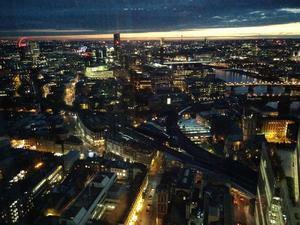 We finished up the day with dinner in the Shard, at AquaShard with David Z., Lynn and Sam. 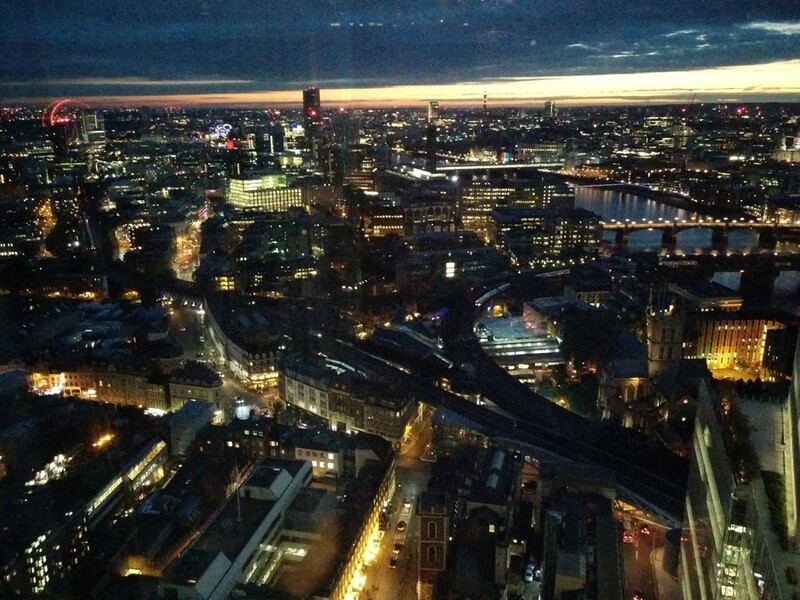 The view was spectacular; the restaurant didn't live up to the view; the company made up for the restaurant. 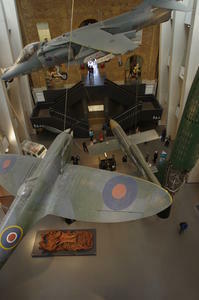 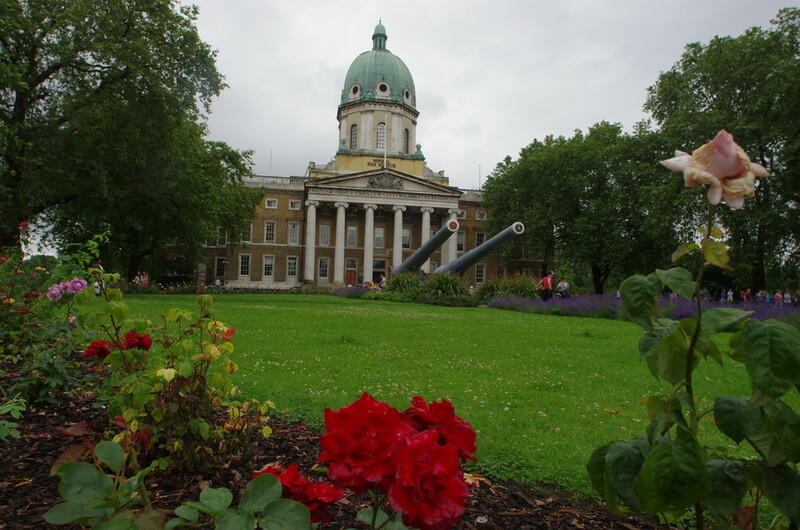 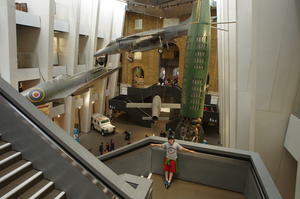 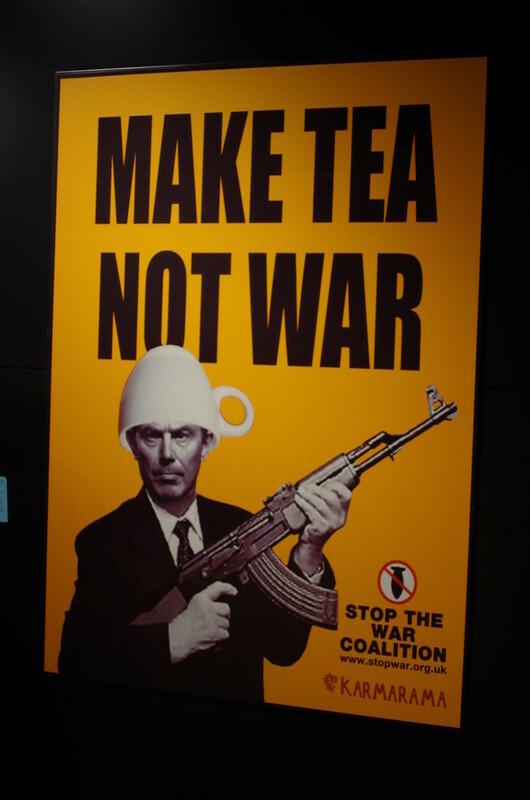 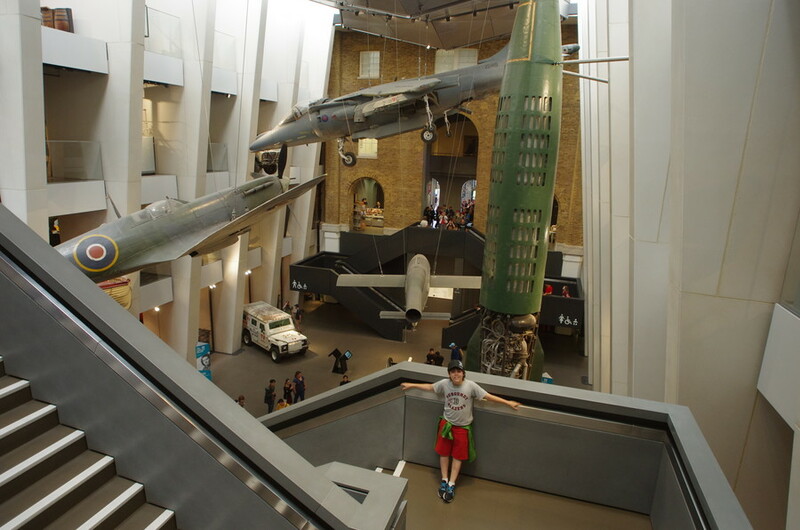 For our last full day, we took a bus (unfortunately, single decker) to the Imperial War Museum. 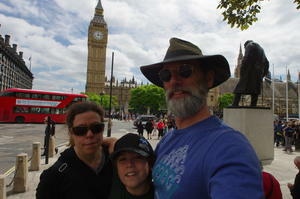 A fabulous way to round out the trip. 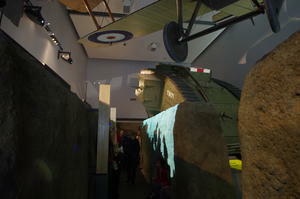 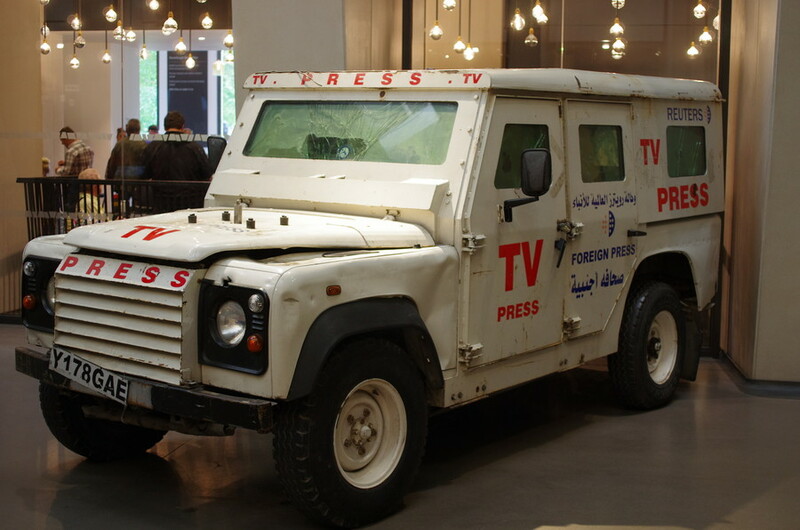 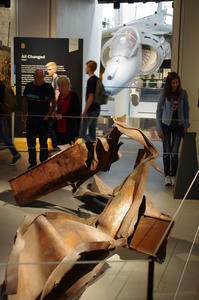 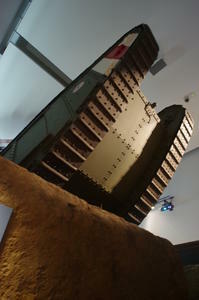 The WW I and WW II sections were engrossing and the museum clearly is updated frequently: they have a news truck from Afghanistan and a piece of one of the 9/11 World Trade Center towers. The next day, we packed up and made our way to the airport (thank you National Express bus line) for our much less than full direct flight back to DC. 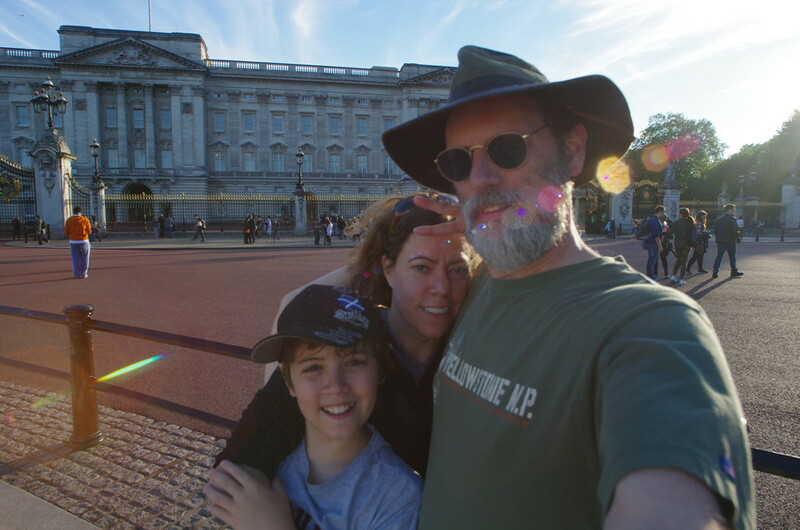 Side note: Robert wanted to see the first Independence Day movie to be ready for to see the sequel this summer. 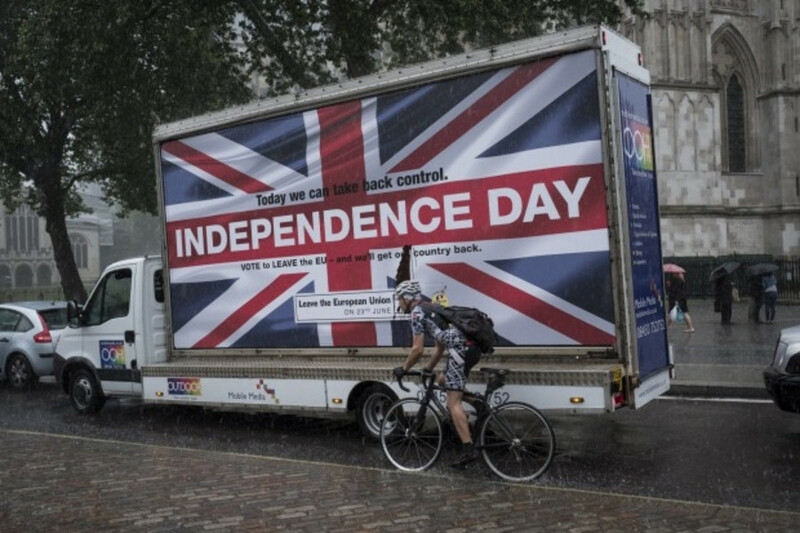 So this advertising truck (Photo credit Adam Ferguson, Financial Review) struck David as pretty funny when it drove by us. It was astounding to be in London for the vote; it will be interesting to see how the impacts of the referendum for Great Britain to leave the European Union play out over the next years and maybe decades.